Jan 31 Liar, liar. No I'm not. Ya, I know that yesterday I talked about taking the way less travelled and not taking the interstates, so what did we do today, took I-10 across New Mexico of course. Look at a map of New Mexico and you'll see why we took that route. One thing for certain about Southern Arizona and New Mexico, you sure know what the scenery looks like because you keep seeing it over and over, kinda' like a geographical Ground Hog Day. 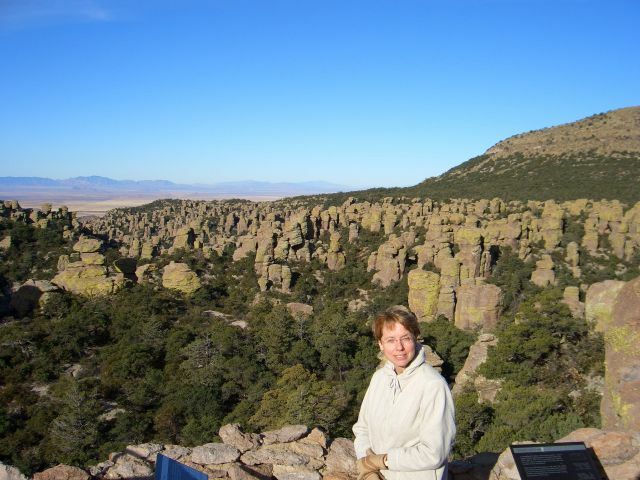 Actually the day started out anything but boring, as we drove over to Chiricahua National Monument. What a neat place. 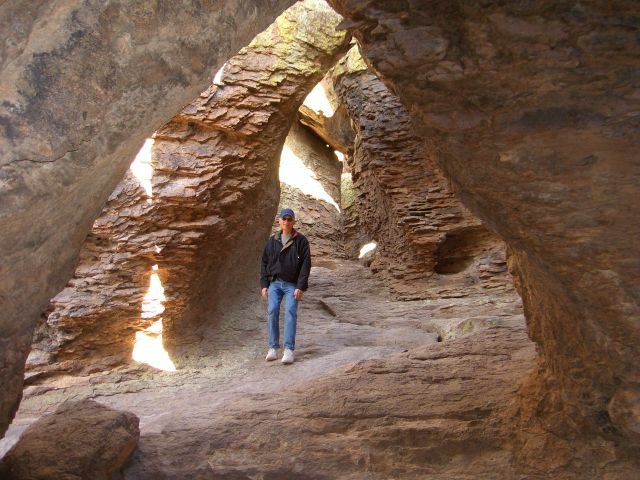 We took a hike down in the canyon among the HooDoos. Thought about what it must have been like when the Apaches were there and simply got lost in another time. It is well worth a visit. 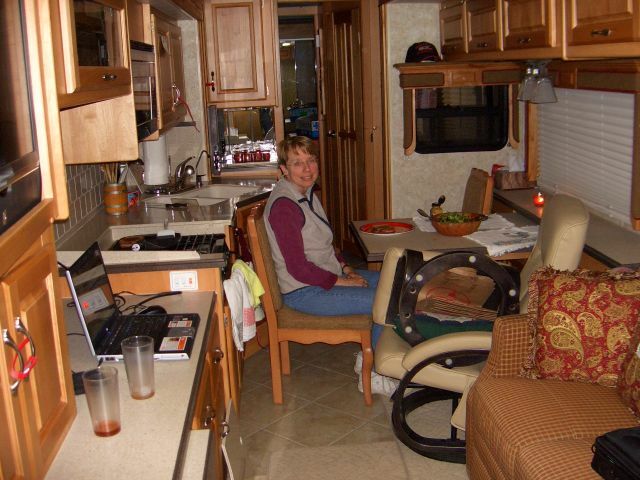 Returning to the RV park we enjoyed a simply delicious lunch of ----yep, turkey wraps. 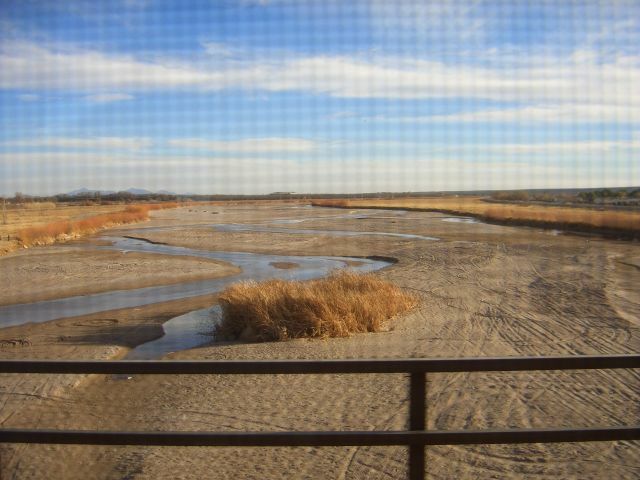 Then began a trip across I-10 to Las Cruces and across the Rio Grande River, which turned into a drive to Alamogordo. 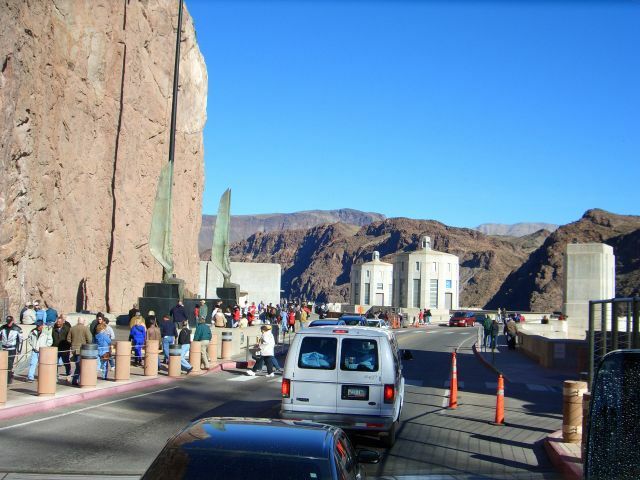 Now I've got to tell you that the drive from Las Cruces straight up the mountain and then straight down the mountain to the White Sands Missle Base is one ascent and descent we both will remember for a long time. Thank goodness for 400 horses going up and the exhaust brake coming down. 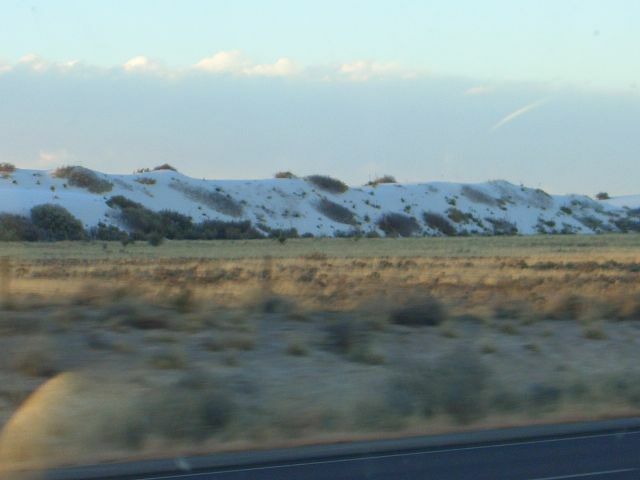 Bypassing a stop at White Sands we arrivred in Alamogordo at dusk, whereupon I did the Bob thing. We had decided to overnite at the WalMart, so Bob got in the wrong lane and ended up going past the store, recovered nicely with Linda's help then turned to go into the side entrance where some old retired looking lady was blocking that entrance and ended up driving through the part of town you absolutely don't want to be in after sundown, before finally arriving with frazzled nerves, back at the WalMart. (Mrs. Jones, my HS english teacher is probably turning over in her grave over that run on, run on sentence!) After more than paying for the privledge of staying with our three bags of items we bought, we dined on toasted ham and cheese sandwiches and salad. Later, it was ice cream before head of the land of zzzzzz's. Jan 30 Travel day heading southwest. Left Mesa in the late morning heading out Hwy 60 to Globe. When we had been considering leaving our former life behind, one of the things we kept telling ourselves was if, if we undertook this great adventure, we would not drive the Interstates any more than necessary. 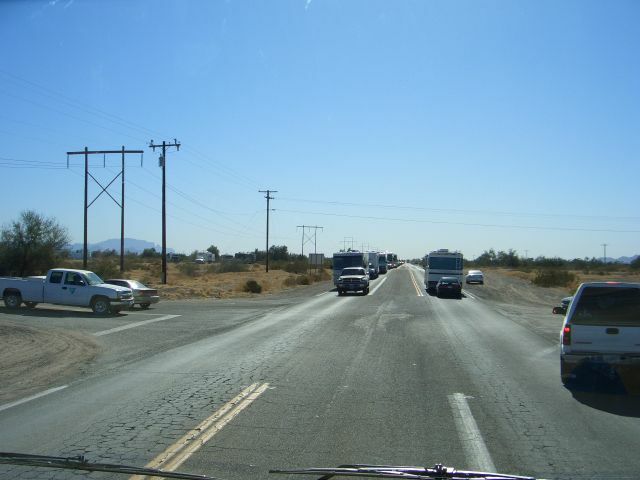 The easy way to get to Chiricahua NM would have been to take I-10, our way is the way less travelled, thus Hwy 60 to Globe, Hwy 70 to Safford, 191 to I-10 for the short hop over to Willcox. 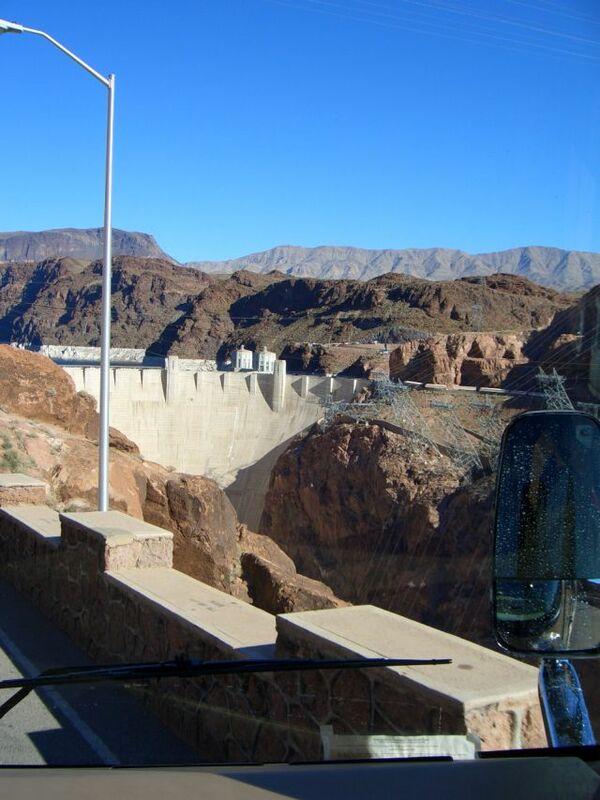 Pretty mountains, huge mines, Indian reservations wide open spaces, very little traffic and an easy drive. So we could get an early start (which we didn't), we have ceral and milk for breakfast. 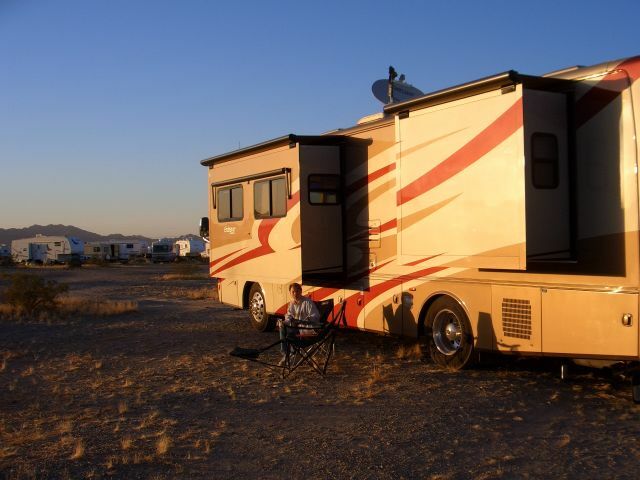 When we had our 24' class C RV we could leave a campsite in 15 minutes, now it takes us more than an hour, but we are no longer in any kind of hurry. Stopped along the road near some mines for the usual lunch of turkey wraps, then drove on down to Wilcox. 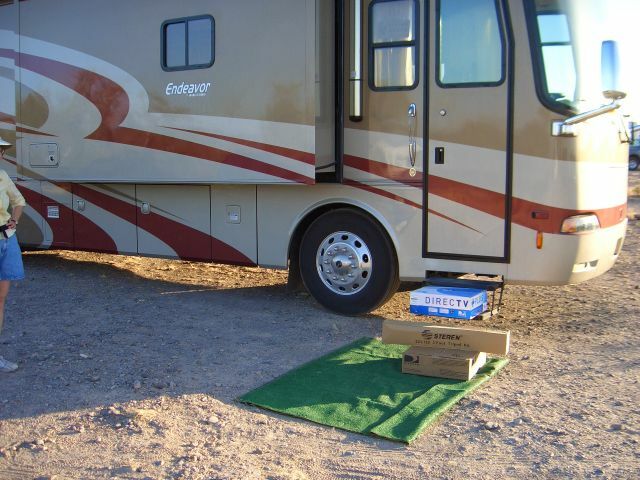 Our arrival at Magic Circle RV Park at 3:30 didn't allow enough time to visit Chiricahua NM today, but did allow enough time to visit with the Rv'ers on either side of us and install one of the Camco vent covers we bought at Quartzsite. 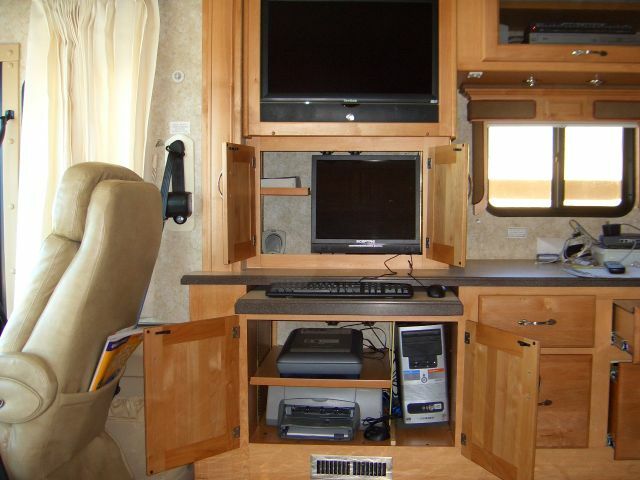 It is a light brown color the matches the RV. Looks really sharp, now if it only works as good as it looks. Dinner was grilled sirloin burgers preceeded by Bob's poor imitation of Dave Beebey's awesome gaucamole. Someday I'm going to nail this one and when I do you'll hear the scream of delight all across the country. After spending a restful evening watching TV, we downed ice cream topped with pecans and called it a day. Jan 29 Old friends today. Ever meet someone and say, wow, what a neat person? Ever think what it would be like to spend time with four people like that? Well, that's exactly what we got to do today! For 20 years at two different companies I had the pleasure of working with a truly fabulous lady named Tressa who daily performed miracles at work. Bruce, her husband is one of those people who would step off a plane in the artic and tell his company to immediately ship every freezer to him as he could sell them all, since, up here they had so much ice, but no where to store it. Understand also that to know Tressa is also to know her friends, so Russ and Kay, he of knowing something about virtually everything and she of being, possibly, the most outgoing person on the planet, joined us later in the day. Between hiking in Lost Dutchman SP to the base of Superstition Mountain, visiting over awesome appetizers and sharing a meal of beer can chicken (something that we are going to add to our repitoire) and watching how well Tressa's new dishwasher worked, we couldn't have asked for a better way to transition from our life in Arizona and the west to our trip back to the east, i.e., today we shall party for tomorrow we head toward Texas. Jan 28 This was our catch up day, as in catch up on the laundry, the shopping, the car washing, the computer network installation, the swapping out of the warranty items, well some of them, little things in life that we still have to do. Thus the morning was spent shopping and the early afternoon spent with Linda making up for Bob's stupidity, but I get ahead of myself. We started off shopping at Home Depot, getting some screws, caulk and tape, so why did it take nearly an hour and a half to purchase these items? 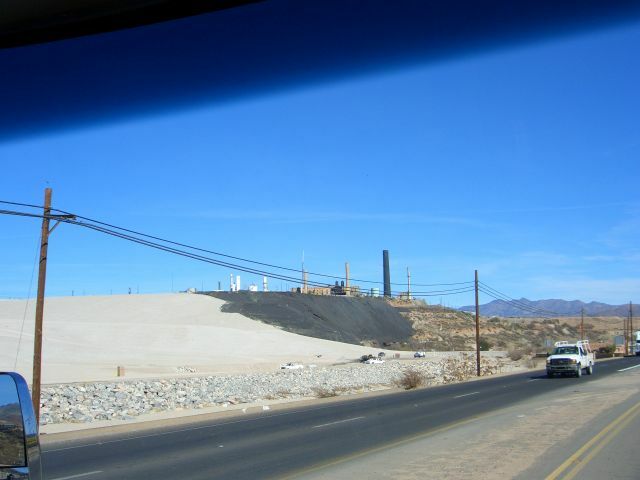 Don't have a clue other than we just got so used to looking at Quartzsite it carried over to here. I know we looked at a whole bunch of things we had no intention of buying and couldn't use even if we did buy. 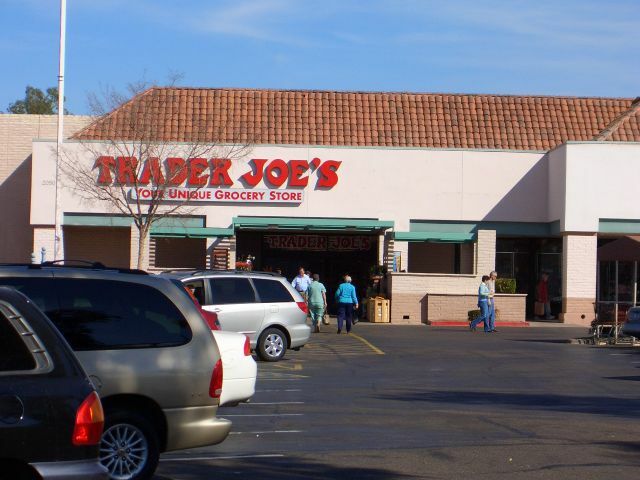 Next we went to Trader Joe's where we filled up on selected goodies because the next TJ's would be in Dayton, Ohio months in the future, This is where the plot thickens or where the two buck Chuck (in Arizona it is three buck Chuck) disappears so to speak, but more later. Next was a trip to the biggest Sam's Club we had ever seen. One that had everything we wanted and more. Upon returning to the coach Linda innocently inquired where the case of three buck Chuck Bob had bought at Trader Joe's was. Wrong question, or maybe wrong circumstance. You see Bob had pushed the cart to the lot and loaded everything into the Exploreer except the case of three buck Chuck Merlot he had bought. Bad Bob, bah, idiotic dumb simpleton Bob is more like it. Bottom line was, skipping a lot of inappropriate verbage from Bob, Linda called the store and Trader Joe's said no one had turned in a case of the wine, but they would replace it for free. Talk about a store that cares about their customers, this is the granddaddy of all those stores. There was no way they knew who we are, but this has been our grocery store for a long time as we often spend $100 to $150 per week on groceries there. 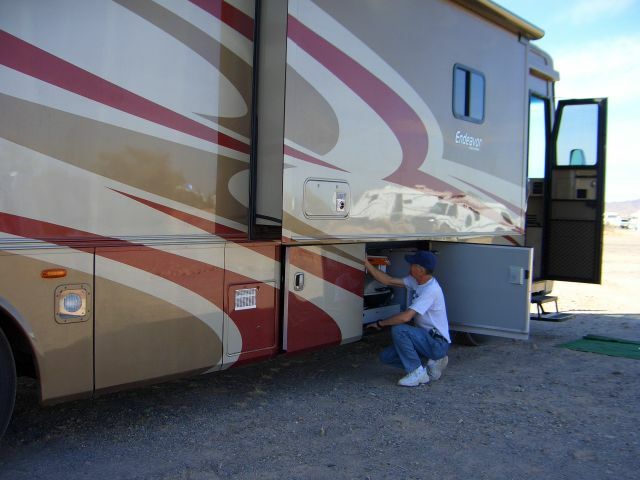 Linda went back and got the case and Bob did a few things around the coach. If you've never heard of them, here is the link, Trader Joe's. Of course you already know what our late lunch was, yep, turkey wraps. Dinner was just as awesome, we had southwestern rubbed chicken smothered in fresh salsa and accompanied by Linda's famous southwestern dark red kidney beans, brown rice and salad. Some day we're going to have to post some our recipes so our readers can enjoy the same great dishes we do, but, sorry, not today. Dessert was a simply unbelievable chocolate, mocha cake with sugar free, low fat ice cream. Talk about ups and downs, today sure had them, but I'll end any day with food like this!!!! Jan 27 We really had a fantastic day today visiting with Linda's niece and her family today, plus pick up our mail and coach warranty items we had shipped to her address. If you could bottle and sell love, you would have an inexhaustible supply at their home. We broke out of our usual mold for breakfast and really enjoyed visiting and eating at IHOP. Discovered they have these awesome whole grain and nut pancakes that are really scrumptious. 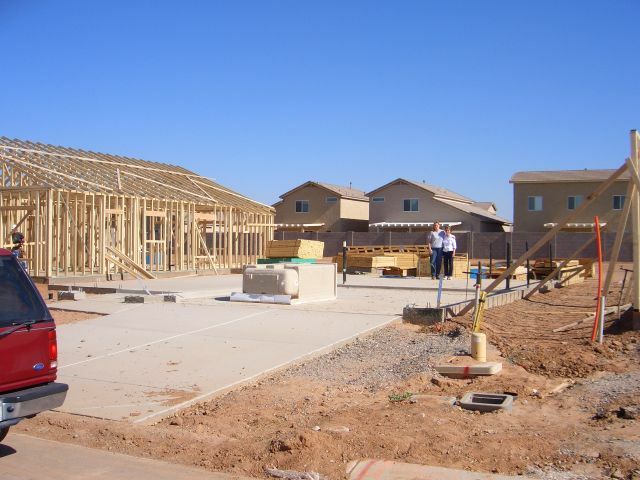 Later we drove out to Coolidge to see their new and first house (walked through the model, as their house is just getting started, but it did have wood ready to go up - boy was she excited to see this progress). It is in a neat growing community, without the things you don't want in life, yet with the things you do want. As we drove back to the Phoenix area I thought about how good things can happen to good people. 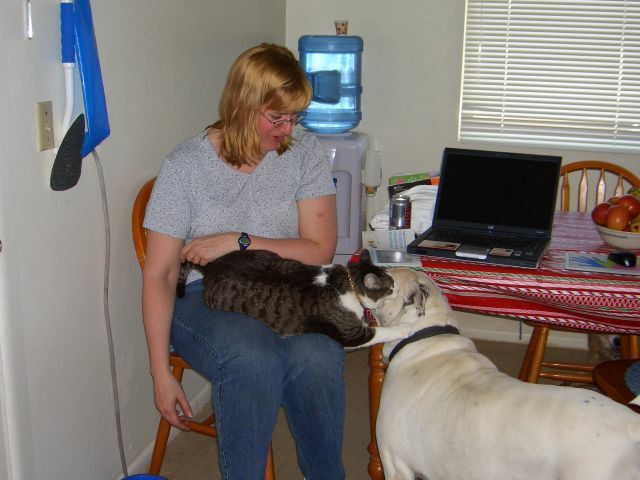 Back at the apartment we were greeted by their pets, all of whom were rescue animals. Later, visiting with her husband and two boys was the highlight of our trip to date. All to soon it was time to head back to the coach for the end of an awesome day. 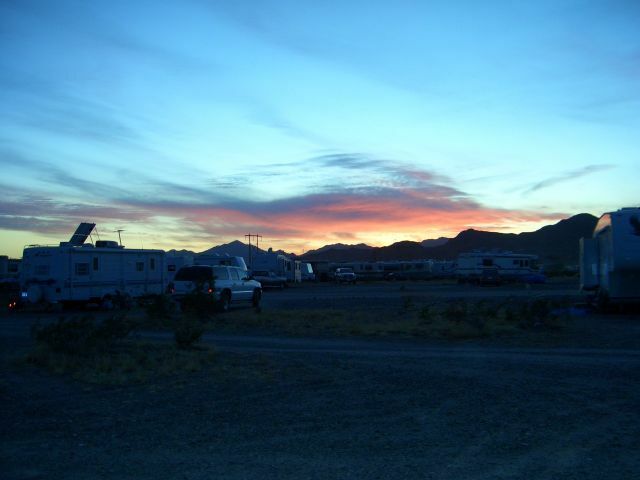 Jan 26 Up early, wonder why, after all, leaving Quartzsite is all we're doing. Having been here for just our first time and only for a week at that, we've fallen in love with this time & place. Is it dusty, definitely, is it crowded, certainly, does it get cold at night, naturally, but looking beyond those things, to us, it has that magical, indescribable something that makes it 'A Don't Miss Happening'. Come back some other time of the year and it's not going to be the same. 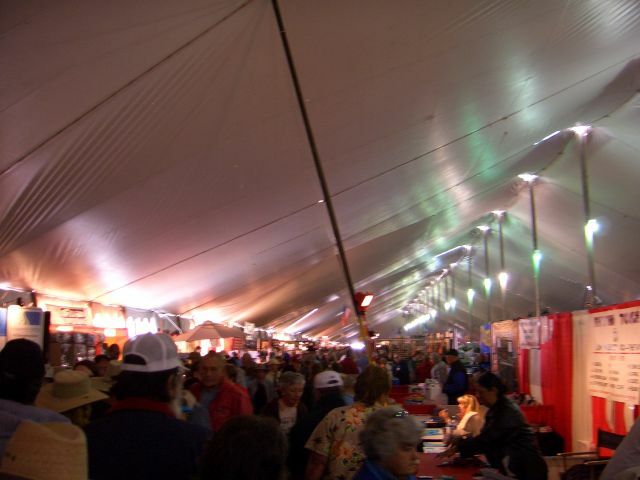 As an example, for years I've read about the unbelievable crowds in the Big Tent on the Saturday morning it opens. Now I've experienced it and what an IT, it is. Getting back to reality, our week old spinach dictated a breakfast of toasted ham and cheese sandwiches, then the moment of truth arrived, would the slide slide. The answer says, yes and no. Stated another way, 4 inches by motor and 12 inches by hand. Oh well, life ain't perfect. Just think, a half rotten peach means you've a half peach that's good! Perspective is important. 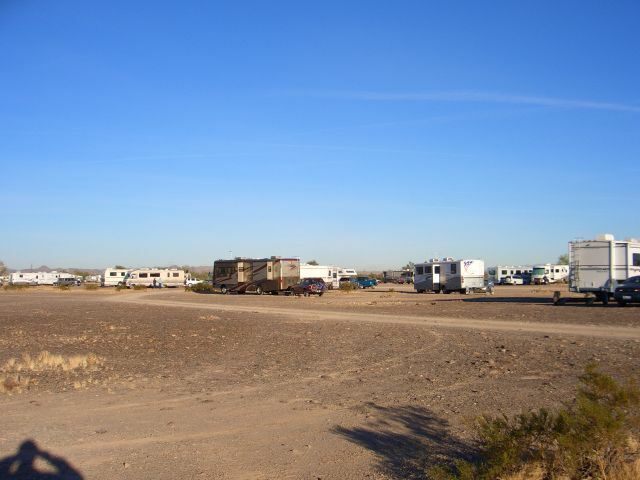 Shortly thereafter we passed the Hitchitch trailer and and joined thenearly constant flow of RV's leaving La Posa North. 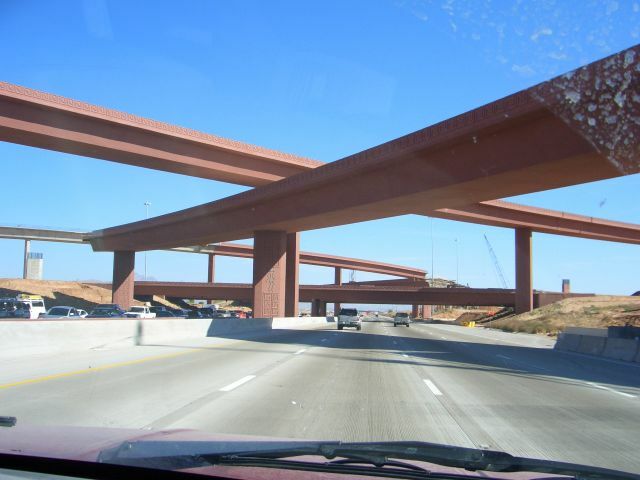 And were soon heading east on I-10 towards more "normal" civilization. Stopped at a rest area for lunch and tried to deploy the MotoSat, but it couldn't find the satellite during our short stopover. We left with Linda behind the wheel for the 35 mile drive to the next rest stop. 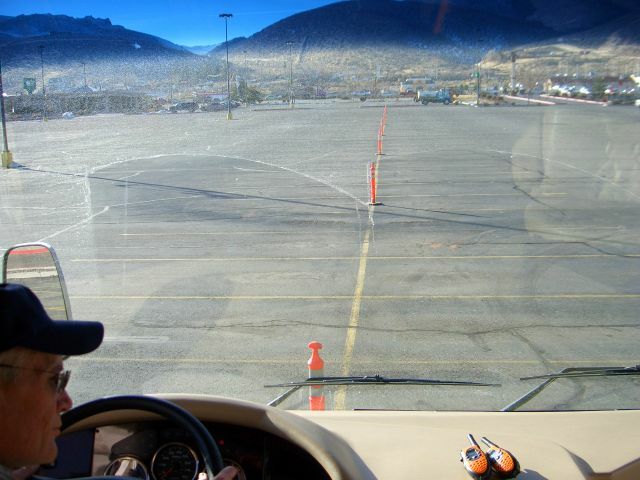 She enjoys driving the coach and wants to keep her driving skills she learned during our lessons, sharp. 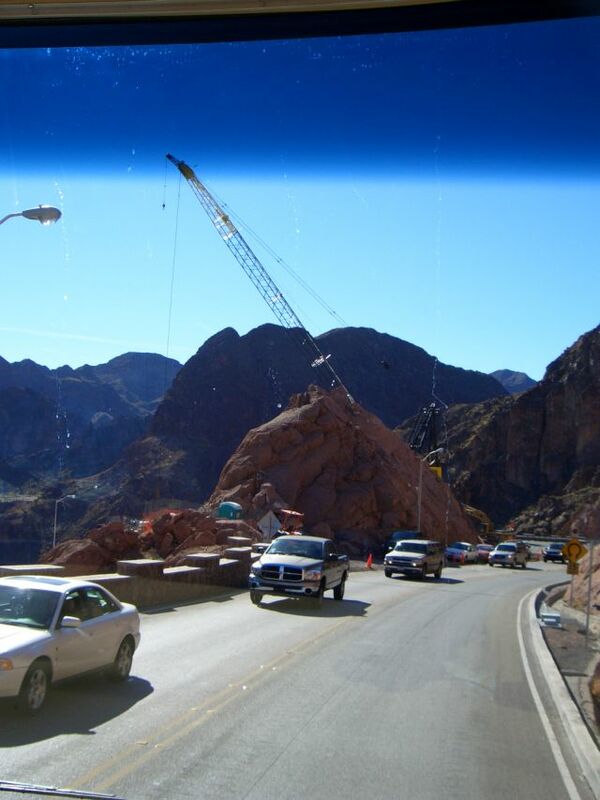 Bob took the wheel for the drive through Phoenix and while there was a lot of traffic, it wasn't to difficult. We kept watching ahead to see what lanes the trucks were using and by following there lead had a leg up on traffic backups. 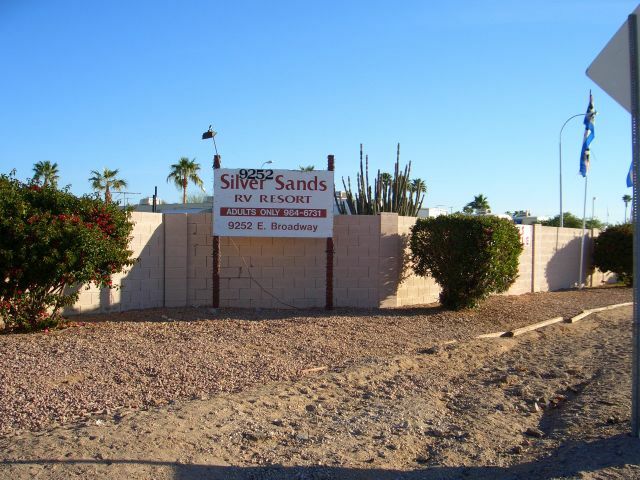 We had picked Silver Sands RV Park for it's central location and reasonable cost for a short stay. We were treated like old friends and really made to feel welcome. They were having a $2 hamburger dinner in the rec hall, so joined in. We had a wonderful time visiting with those at our table. 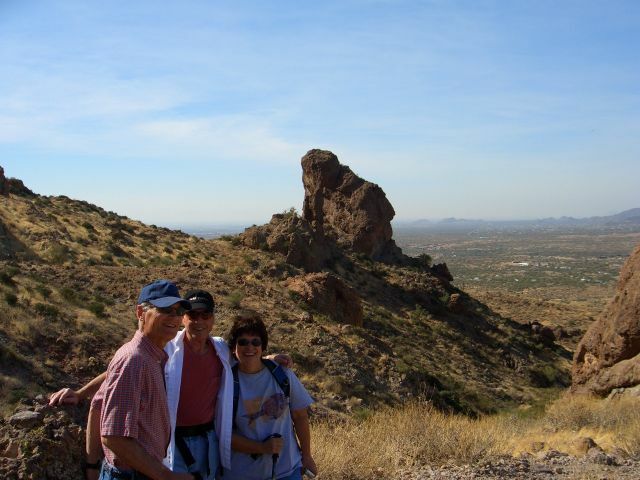 They were Canadians, French Canadians to be percise, who had retired last summer and were spending their first winter in Mesa. The 50/50 pot had been won by one of them last week, so he got to draw the number this week. Whose number should he draw but his sisters! 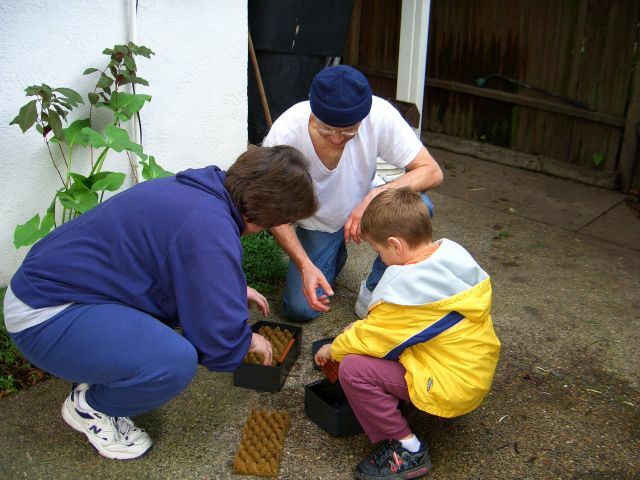 She shared the pot with her husband, gave him his dollar back and kept the rest. Women are the same everywhere in the world!!!!! 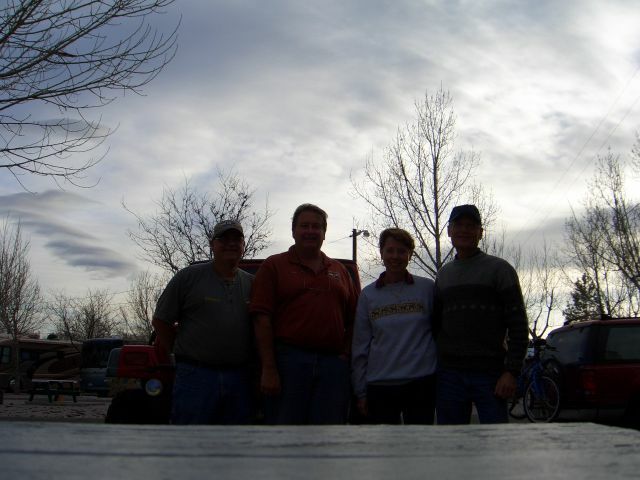 Jan 25 Counting down the days till we leave Quartzite as we are moving on tomorrow. Leaving will be hard as we really love it here. Another day of shopping is on tap to buy all those items we saw, but didn't buy, but now want to buy, but don't remember where we saw them. 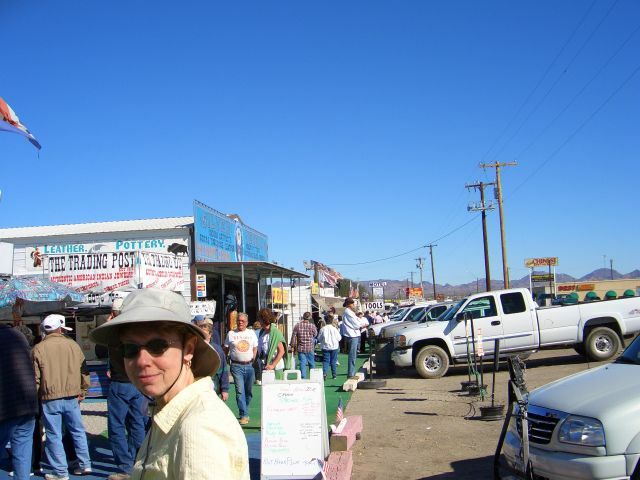 One of the scenes that is so typical of Quartzsite can be witnessed down at the intersection of 95 and Kuehn St., where in the afternoon most everyone there, and there are a lot of people there, have one or two plastic bags and assorted other treasures. Today we will hopefully be one of them, if we can remember where we saw the "stuff" Linda wants to get (I'm the carrier, aka, lugger backer, while she's the PA (purchasing agent). After a quick breakfast of oatmeal and fresh strawberries (Lamm's Produce stand is great), off we went. 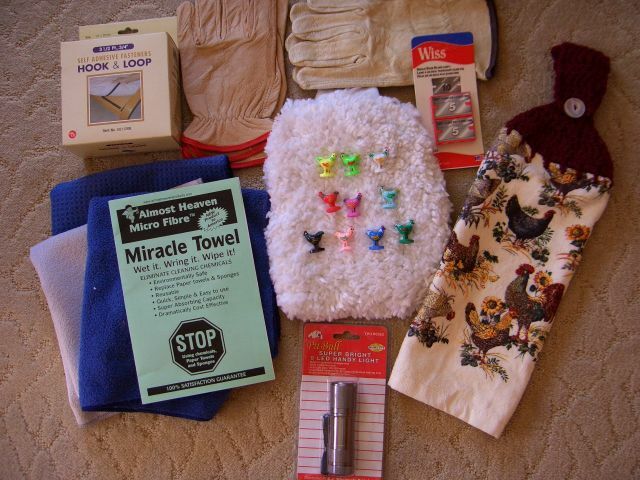 Much walking and searching ensued, but most of what we (she), wanted was located, examined and purchased. Suffice it to say, a 50 amp autoformer weighs a lot more after you've lugged it 1/3 of a mile than when you bought it, same for a complete Direct TV DVR, dish and tripod setup. 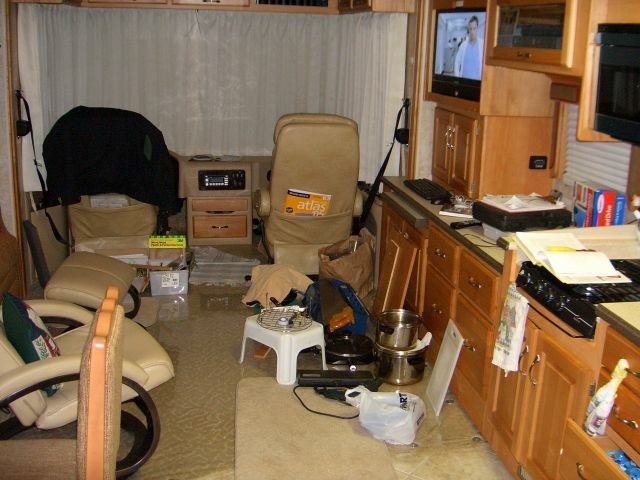 We actually didn't get everything we wanted as 3 trips down there from the RV walking back fully loaded was all the lugger backer could take. You'll notice all the heavy things were one's I wanted, however it only works that I carry the things she buys, not the other way around with her carrying what I buy, sigh. After lunch of, yep, turkey wraps, we shopped for some more things which we will buy tomorrow before we leave. Dinner was grilled sirloin burgers on olive oil drenched whole wheat buns with grilled yams and chilies, man do we eat good!!! 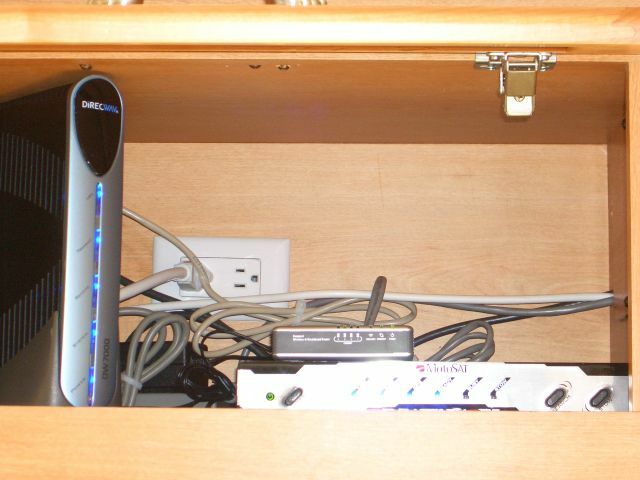 After some serious questioning if taking the option of the free tripod & meter versus free installation of our Direct TV, yes there were also other indelicate words used, the installation of the system was completed. (This deserves a separate article later!) Pyro-Mom then built one of her famous conflagrations, after which we feasted on spice cake and ice cream before calling it a another great day. SWP This a Special Website Post. These will not happen very often, but this was too good to pass up. One of our children has always had a wonderful ability to use words in the most marvelous way. Today we received an email from her that included the following. We hope you enjoy it as much as we did, I'm still chuckling as I type this: "As you know, we had a rat or rats in the under skirting of the hot tub that eventually gnawed on our boat. Well, we put bait down in the hot tub 2x, but never saw any dead rats. Well, Sunday was the day we decided to clean out the rest of the under skirting of the hot tub. To Eddie’s surprise he found 2 dead rats. (They were really, really dead!) After putting them into bags with my help, as I wiggled around the backyard, saying such things as Oh my Gosh! Don’t let it touch Me!!!!!!!! This is soooo Gross!!! , he left with Lindsey to go get some more softball equipment and left me to clean up the rest. (I was cool with this, I thought) Well upon vacuuming up the chewed up insulation and rat poop, I found 3 more dead rats. Two were easy, but disgusting to clean up, but the third one was a problem. I found its tail sticking out of a crevice. I was trying to be brave so I attempted about ten times to pull the rat out of the tight crevice. I had on a glove and not much courage. I tried prying it up with a long screwdriver, which helped, but only added to the increasing pungent smell of dead rat. After trying, screeching, wriggling , throwing my hands up in the air with a huge, YUCK!!!! !, I finally called Eddie and asked him to come home to rescue me from the dead, mangled, stuck rat. He was home literally in 30 seconds, he must have felt my energy pulling him home and then he proceeded to extract the rat. I, at this time, was dumping out the shop vac full of rat poop, rat hair and stuff left behind when we scooped the rats up. Needless to say, I was happy not to be with the rat, but not really happy. After cleaning it all up and hosing off the backyard, scouring myself and wriggling through the house every time I thought about holding the rats tail -we went to Lindsey’s softball team meeting at Round Table." We may not be able to be there to share our love with our kids, but when you get something like this - YOU ARE THERE! Jan 24 This was supposed to be a laid back, retired couple, do nothing day. So why is it 8PM and I am just starting to update the website. Well, let me see, guess it started this morning when Linda said, "Bob, it's 10AM, when are you going to fix breakfast? "We had been busy trying to deploy the MotoSat, then some new neighbors moved in, or should I say, tried to move in. 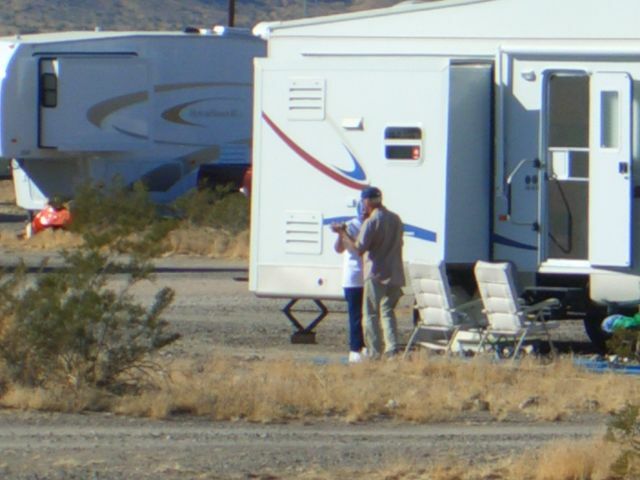 They were in a pickup camper towing a trailer. The area next to us is marked off with rocks into a large square, about 60 ft by 100 ft, with two entrances on one side. You'd think it would be easy to pull a rig into that space, but not these people. For about 45 minutes they pulled in one way, the woman outside, giving some unfathomable signals as the man corkscrewed the rig forward and backward. After a while he would pull completely out one of the entrances and start all over again. 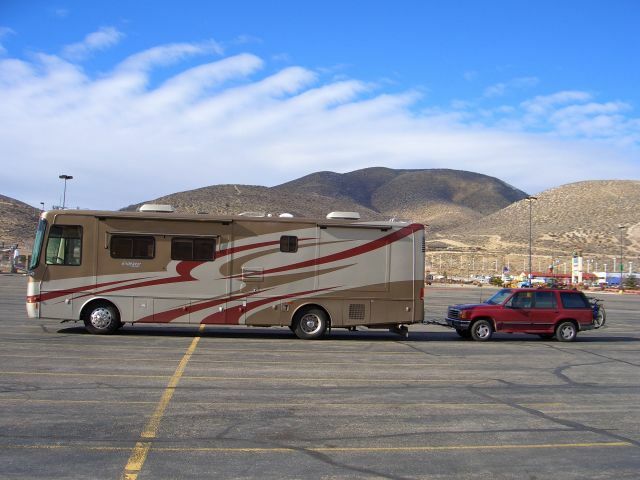 Finally got it parked in the back corner as far from any other RV's as possible. If they don't like people nearby, why didn't they go down the road a couple of miles, there you can get a couple of hundred yards from your nearest neighbor. Oh well, they were fun to watch. Finally got down to the Big Tent and soon Linda was in her element. Didn't take her long to clean out my wallet, though as the day went on, she always seemed to find a few more dollars in her wallet whenever she saw something she wanted. Sometimes I wonder if she has a printing press in that purse she carries! 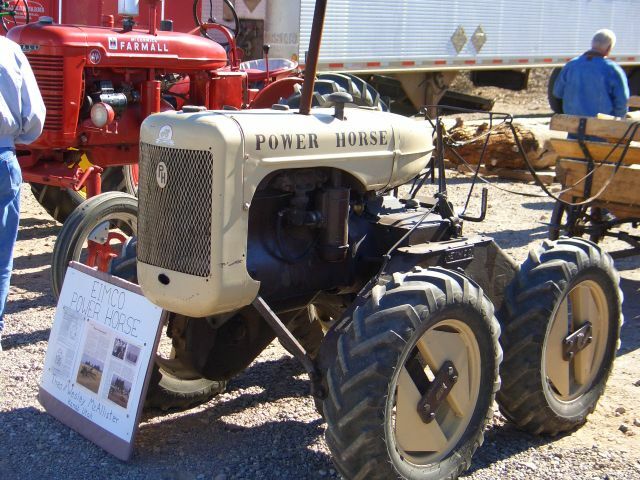 At least we didn't come home with anymore micro-miracle fiber rags that do everything but turn water into diesel. For those of you that are familiar with Linda, aka the chicken lady, she did contain herself and only bought 3 items with chickens on them, though one of the items was a bag with 10 Mexican Train chicken markers in them, watch out Sally! After all this, we returned to the coach for, you didn't guess it cause today we had ham wraps, not turkey, then installed a holder for our olive oil, EVOO, and vinegar (white) bottles for when we travel. Later we sat out in the warm, almost hot weather soaking up the sun, drinking iced tea and shelling peanuts. Dinner was a sinfully delicious mustard crusted grilled salmon fillet with brown rice and salad. 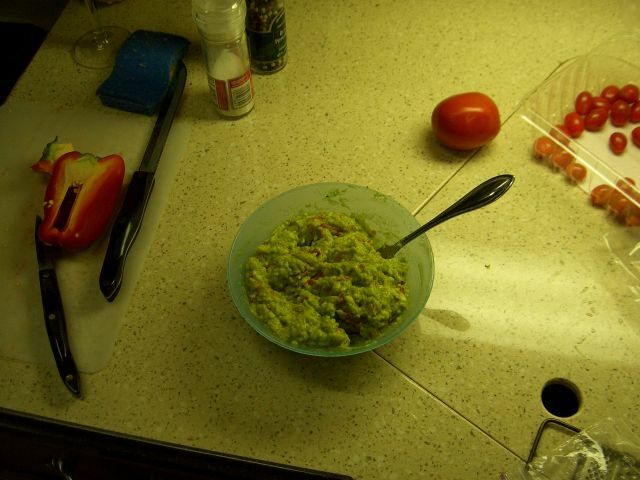 Even Emeril would have been proud of Bob for this meal. Jan 23 Solar day today, which also means putting away the many little "makes it like home" things we've left laying out the last week. Our appointment is for 9AM, it's 7:30 now and we've got breakfast and pulling in the slides left to do. After the installation is completed, we are going to drive to the La Posa south area and dump the tank. The gauge on the black tank has been showing 2/3rd's full for several days. However, the fresh water just changed from full to 2/3 and the gray still shows empty. This doesn't work mathematically, however maybe I am as full of you know what as Linda sometimes tells me I am. Oh well, better safe than sorry, or put another way, better empty than overflowing. After a breakfast of multigrain cereal and milk, finished putting the last few things away, walked up to the dumpsters with our trash and started to warmup the engine prior to pulling out. Had one minor problem. The roadside slide would not come in all the way. Got the ratchet out and closed it so we could get to the solar dealer, will deal with it when we get back to the site. The solar install went great. 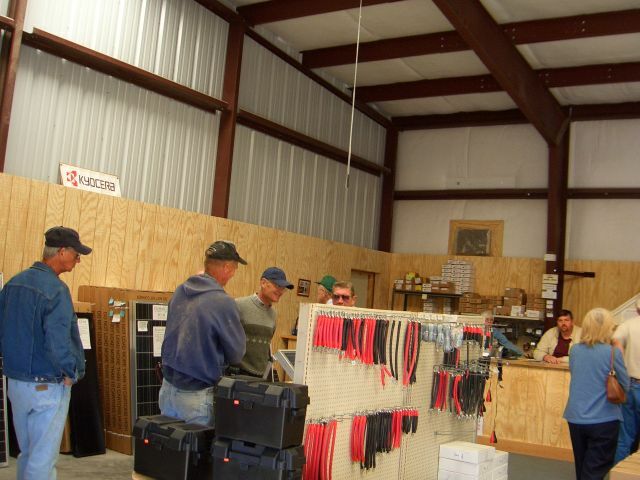 Our installers, Carl and Stan did an outstanding job. Discount Solar was the dealer we selected based on recommendations on the web, they are good people. We drove with the Quartzsite traffic jam on the way back, uneventful excet for an old @%$# on a scooter that turned right on red just as we were turning left with the arrow. As we completed the turn he got really squeezed between us and the curb. Idiot!!!! Returning to La Posa North we decided to pass on heading south on 95 to the dump site as traffic (mostly RV's) was backed up as far as we could see. At the camp we tried to figure out what was wrong with the slide that won't. We checked the fuse, it was good, then voltage to the motor, we had 12 volts at the connector. Linda tried the switch again and it worked for a couple of seconds. Bob wiggled the connector and it worked intermittently. Bob slightly expanded the male prongs and, voila!, it worked again. Time will tell if this is the problem. Rode our bikes across the road to where the Datastormusers.com group is having a informal get together. We met some really great people and learned a lot about the lifestyle we are undertaking. Later sat on our "veranda" with a gin & tonic and a bag of peanuts in the shell reflecting on how good life is. Don't have to tell you what was for lunch, the usual, but dinner was grilled fresh sirlon burgers, chili peppers and yams with salad. Later it was surfing and email, gotta break-in the new MotoSat, followed by spice cake topped with ice cream - all South Beach of course. Jan 22 TODAY we got our MotoSat system installed!! Oh Happy Day!! 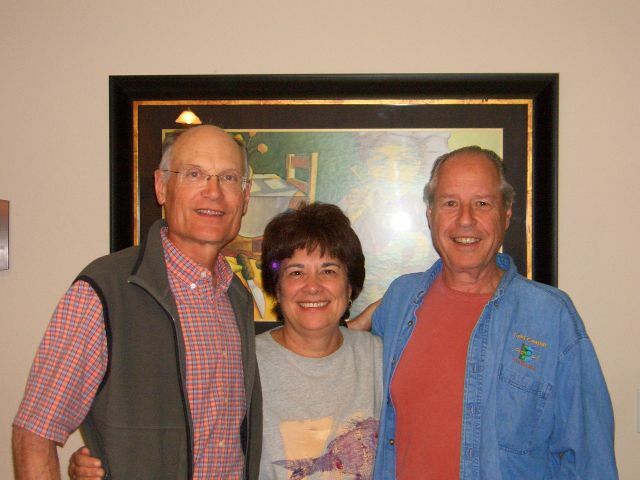 The installers, Bill and Janet Adams arrived at 10:00 AM, just as promised and Bob escorted them in from the LaPosa North entrance to our coach on his bicycle. They immediately began to size up where all the components would go. 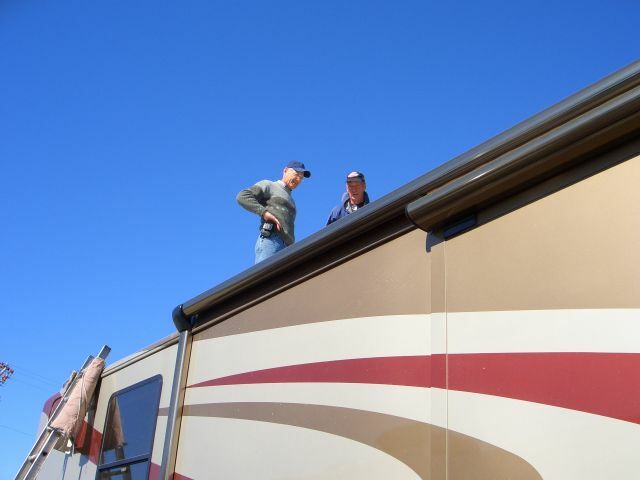 Bill handled the inside install while Janet did the roof installation. 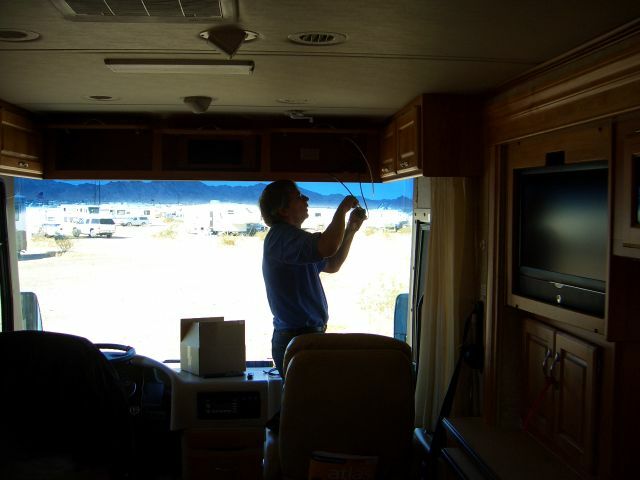 Talk about professionals, we now know why everyone seems to say if you are going to get a MotoSat installed, have Bill and Janet do it. Bill says they really do not do anything special other than simply try to treat their customers exactly as they would like to be treated. 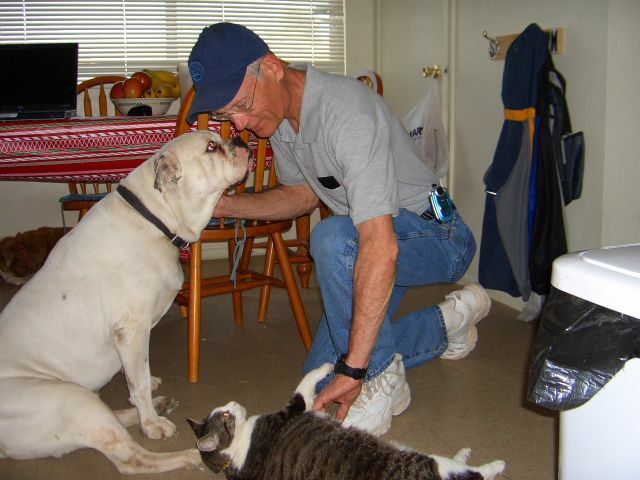 The commissioning of the unit took very little time and would have taken less time except for Bob (What About Bob!). As Bill was setting it up he went over the many things to do and the very few things NOT to do. 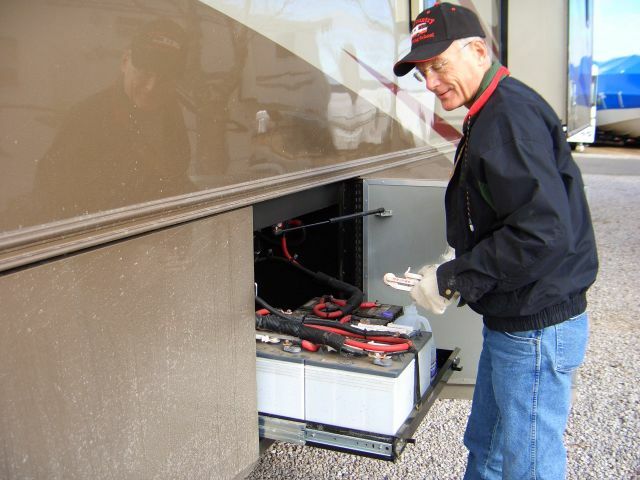 The key not to do was to 'not shut off the power in the coach when the unit was running'. 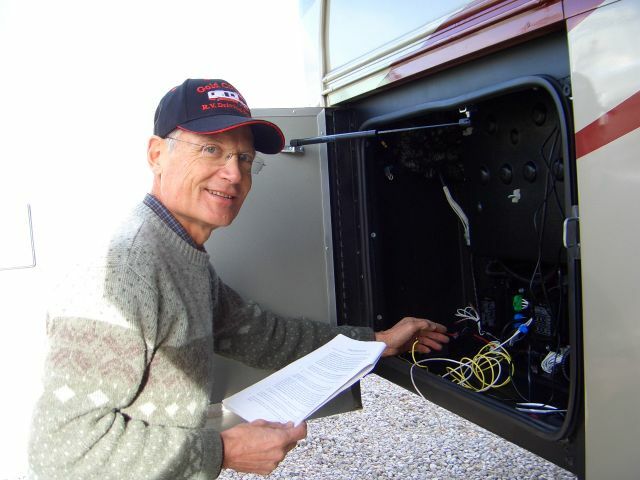 About the time Bill was nearly done, Bob hit the inverter button, shutting off the power, BAD Bob, bet he won't do that again. 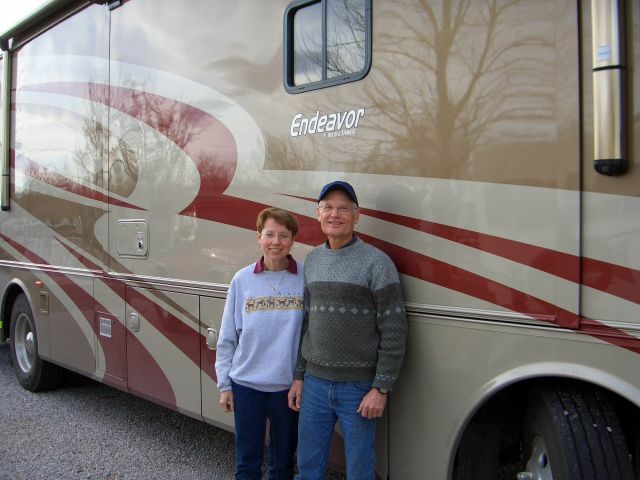 Before we knew it, Bill and Janet were driving off leaving two very happy customers downloading mail, uploading the web site and surfing the internet. If you would like to know where we are--click here, and look for user number 2917. So as we eat our chicken fijitas tonight we are now among the select few with a 'blue light' emitting from our roof, the photo below does not do it justice. Jan 21 This was the coldest morning we have had since we left Carson City, 28º. After a breakfast of shredded wheat and mixed fruit we walked down to the Big Tent. Traffic was already backed up as far as we could see, the parking lot was completely full and the show was just starting! It was as crowded as people said. Still it was a lot of fun. We spent some money on things we need and some things we wanted and also some on things we will probably never use. We returned to the coach in the early afternoon and had, you guessed it, turkey wraps, for lunch. Later we took a bike ride around the area to the east of where we're parked. During the ride we saw a Monaco Dynasty with a fake hookup for water and electric. Maybe those high end coaches come with their own hookups, ha,ha. After we got back it appeared to get even weirder. Our neighbors in the 5'er out the front window looked like they were dancing. When we took a closer look, that's exactly what they were doing. Wonder what we will be doing in a few days? Dinner was turkey burgers, southwestern beans and salad. Linda forgot to get out the leftover sweet potato's, a fact Bob reminded her of later in the evening, somewhat to his regret. You'd think after all these years he'd know when to keep his mouth shut. A freshly baked spice cake topped with applesauce and accompanied with warm irish cream flovored milk finished the evening. Tomorrow is another big day as we will finally be back on line with the installation of our MotoSat system. 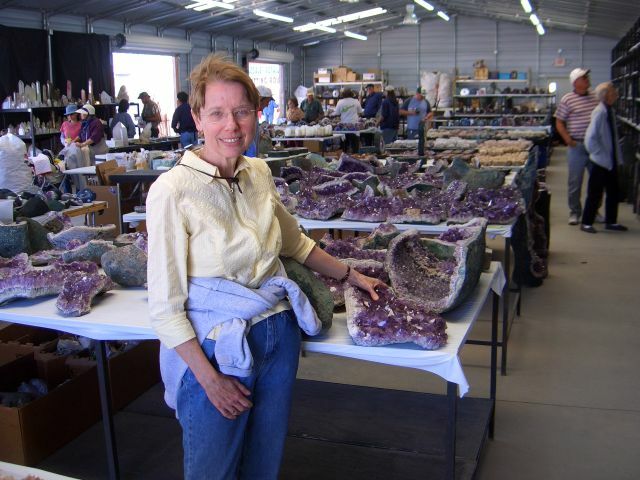 Jan 20 We took a page from Nancy Sinatra and walked all over Quartzsite today. Fortunately we were wearing walking shoes rather than boots! 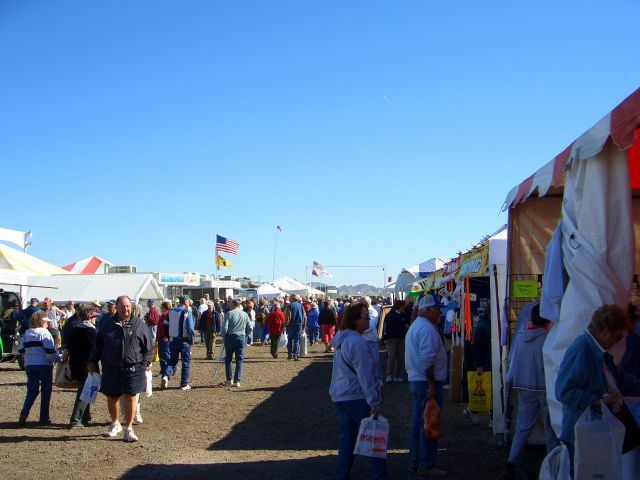 Linda's brother had planned to come to Quartzsite for the experience and also to attend the tractor show, unfortunately a back operation rendered him immobile for a while, thus it fell upon the shoulders of his kid sister to attend and document the show. She was up to the task and then some as she came close to walking the legs off me today, something that has never happened before! I'll have to talk to her big brother about him asking her to cook more desserts, ha, ha, ha. We found a "hit and miss" show up at the main event, which is at the far west end of Main Street, and not only was it to be really fascinating, but Linda also took lots of pictures to send to her brother. Walking back along Main we window shopped, actually it is more accurately called tent shopped, for what seemed like hours because it actually was hours. 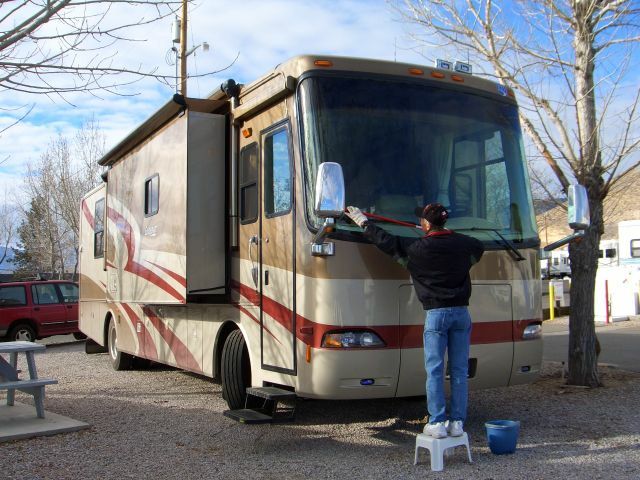 We ended up with several inexpensive doodads that we couldn't do without, a valve stem cap for $0.10, a cable barrel connector and slip on connector for $1 & $2 respectively, again real necessities when you're trying to get the cable hooked up at an RV park, especially after dark and in the cold. 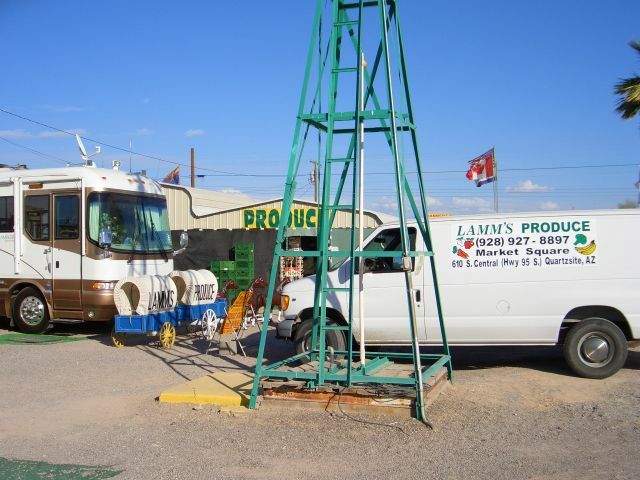 Later we made our daily trek to Lamm's produce stand and got fresh vegetables and milk for dinner. 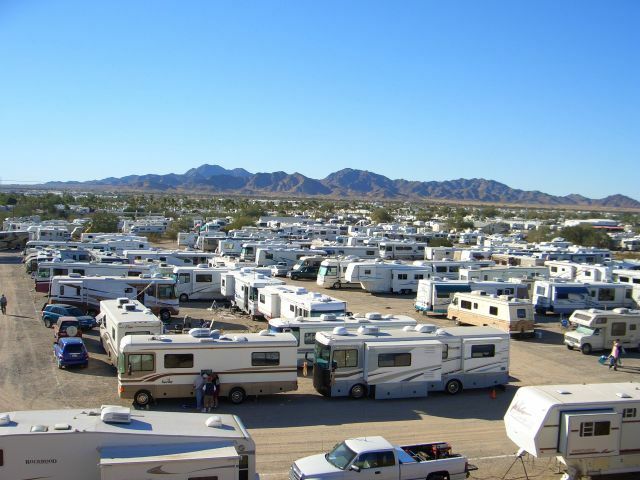 After returning to our coach we were astounded at the number of RV's that had come in today. 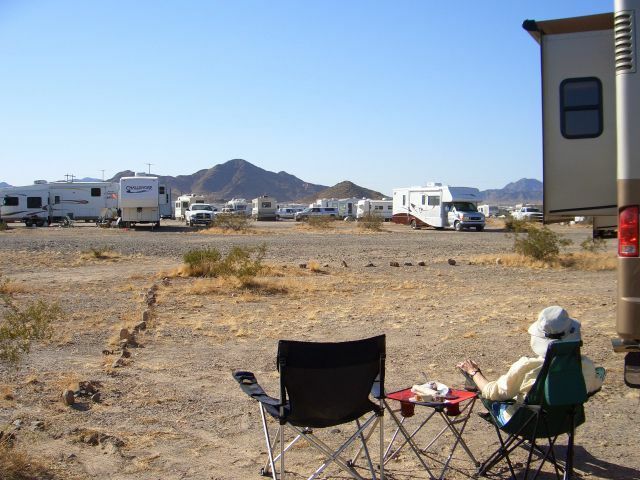 We can no longer watch the traffic on Hwy 95, the view is now solid RV's.The area behind us across the wash is a sea of white whales and the hum of generators is more akin to a roar. We love this place!!!! After relaxing and reading out in the sun, drinking fresh lemonade, we returned to the coach as the sun set turning the mountains to the east a brilliant red (sorry no pictures as I was so awed by the colors I forgot about taking photos). Then spent the evening watching TV after eating a meal of chicken in wine sauce with wild rice and asparagus accompanied by some 2 Buck Chuck Merlot. Hey after sending the big bucks shopping today we had to economize somewhere! Following a dessert of vanilla pudding fortified with bittersweet chocolate chips and chopped pecans we hit the sack so we could be up early to be at the Big Tent when the show opens tomorrow. They say it is literally wall to wall people where you can only move if the person next to you moves. That we want to be part of!!! Jan 19 A day of domesticity. Our water and waste tank situation is excellent, so it was hot shower day. Breakfast was oatmeal over mixed berries, topped by chopped walnuts and cinnamon, yummy. 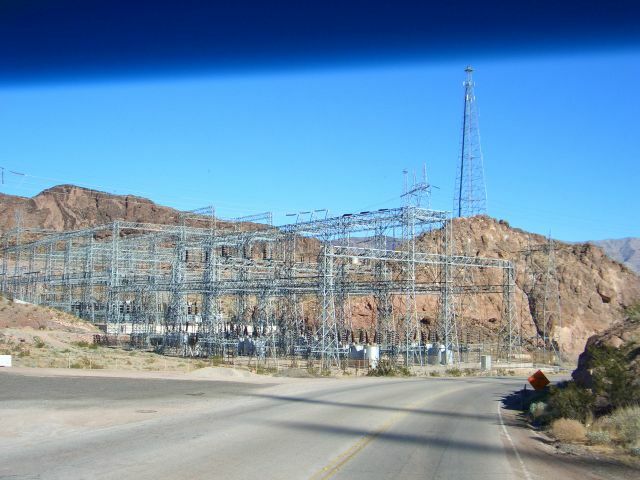 We then took the Explorer and drove down 95 to the La Posa South area. Driving in we passed the waste dump and fresh water stations. 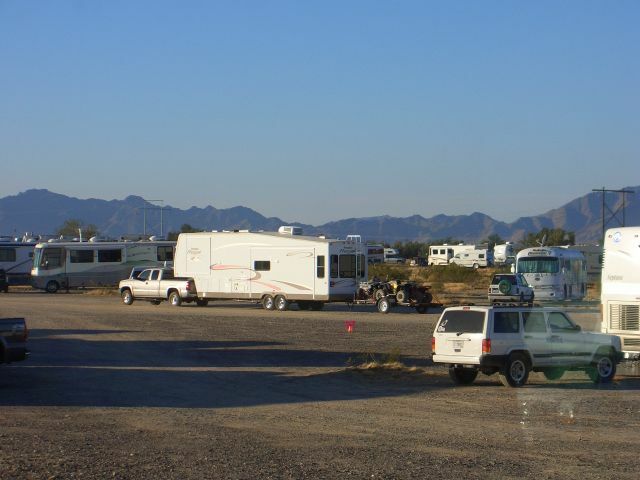 We were suprised that there were only 2 RV's at each station, thought it would be alot busier. Next went across 95 from La Posa South to Tyson Wash and drove through there. They all look the same to us. Next drove back towards home, stopping first at La Posa West, which is directly across 95 from our entrance, again looks just like where we are. After returning home, the winds which had been predicted for today, began to blow, then were blowing, then were really blowing with dust everywhere. Seemed to me to be the perfect time to go out and clean some windows. Gave us a really nice view of the blowing dust. Inside there were many things to do. We had taken up the protective plastic on the bedroom floor last weekend, so today it was time to take it up in the main living area. Didn't want to be one of those people who sell their coach with the plastic still in place! Then cleaned the tape residue and mopped the tile floors. 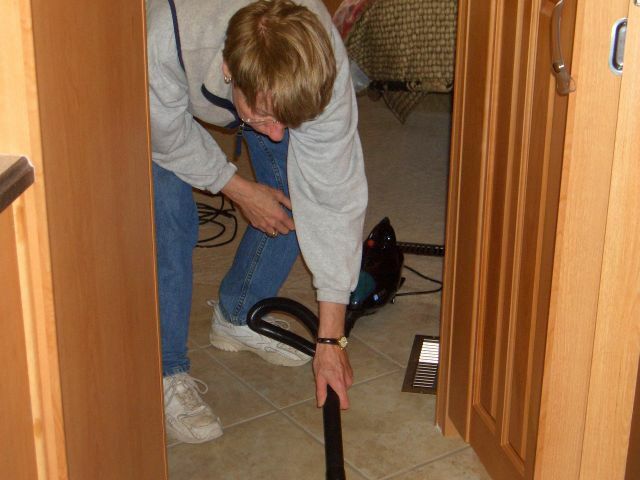 Swept the carpet with the commercial Oreck we got on Ebay (a really good vacuum), then used the hand vac our daughter got us to get all the nooks and crannies. This was followed up by cleaning the many mirrors and later dusting. The coach looks better than new. After a lunch of white bean chili and rye crisps, we took a long, slow bike ride around La Posa North seeing only a very small fraction of the area. 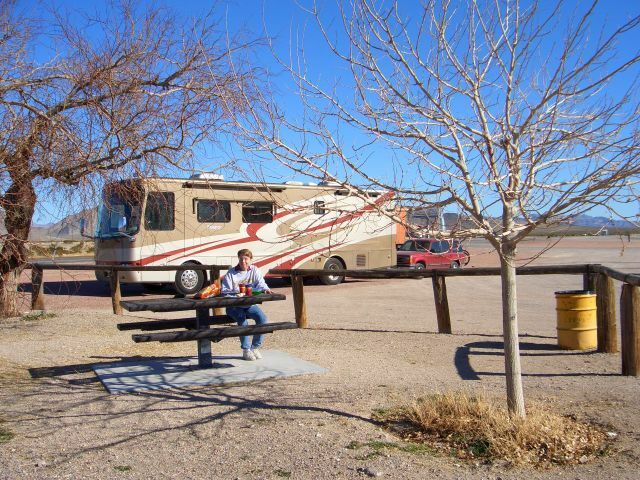 As we rode we saw hundreds and hundreds of nice places to park an RV, this place is unbelievable. Later we sat outside in our chairs, eating peanuts and watching RV after RV drive in and disappear behind us, filling many of those hundreds and hundreds of nice places to park we had seen on our bike ride. Dinner was grilled salmon, garlic sauteed asparagus, wild rice and salad accompanied by the last of the Meridian Cab/Merlot blend - note to Bruce - if you thought the Meridian Merlot was excellent, this blend is simply fabulous, give it a try, Trader Joe's has it. Took some photos of the sunset, later spent some time looking at the stars and eating brownies before calling it a night. 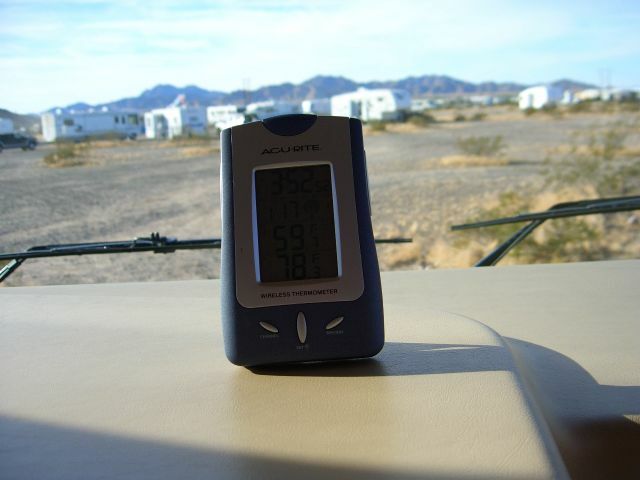 Jan 18 Another day in Quartzsite. This turned out to be a really happy morning for Linda. When she opened the front curtains, what should her wondering eyes spy, none other than one of our neighbors hanging out their laundry! There she stood, smile on her face, describing each piece, whether utilitarin or a feminine dainty as it was hung on the clothes lines. And clothes lines they were, because they stretched back and forth under the awning, then out to their truck and back. After a breakfast of toasted ham & cheese sandwiches with grapes on the side (gotta love eating the South Beach way) washed down with hot chocolate (Bob) & coffee (Linda), we took a walk. 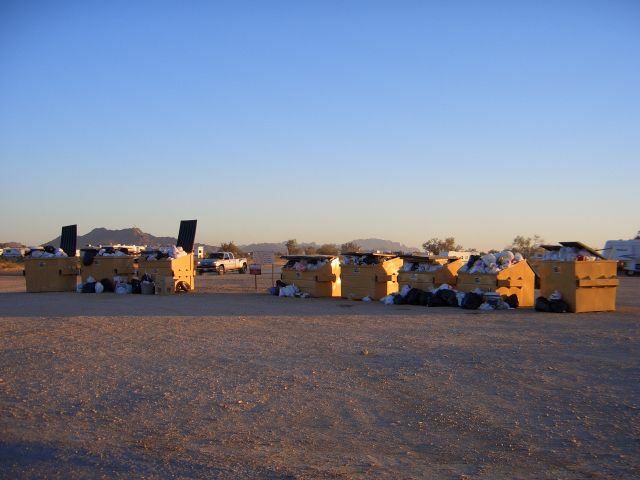 Discovered the trash dumpsters are about 2 minutes from the coach, then circled back on the other side of the wash. There is so much open area out there. What happens is everyone wants to be on the far northern edge, which is adjacent to Rice Ranch and very near the Big Tent area. Since our plans included getting a solar system installed, we drove into town to do some exploring and shopping. Main Sreet runs parallel to I-10 and is stop and stop without much go, bumper to bumper traffic. 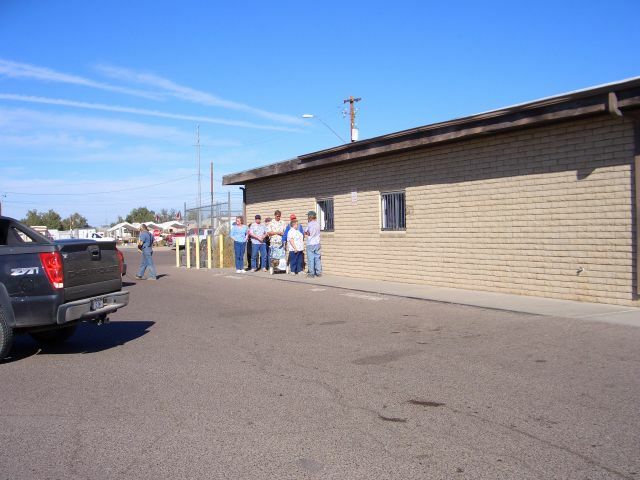 We took a run up and back on both sides of Main, seeing Solar Bill's 2 locations, City Solar and Discount Solar. Then we ran out to Hi Jolly to see if the Solar truck we had noticed the other day was still there. 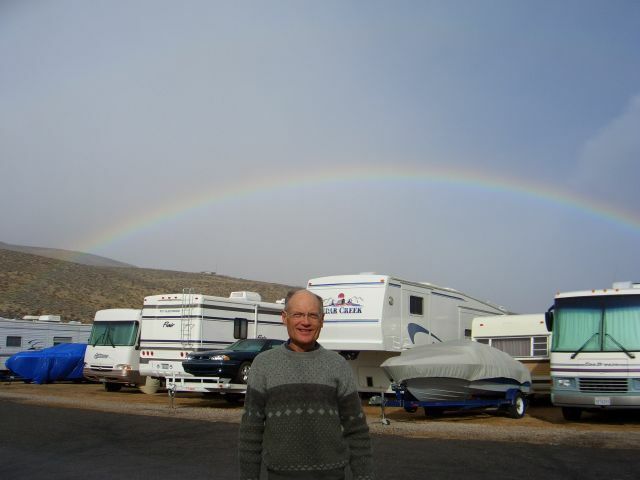 Spent quite some time there, a really nice fellow, but unfortunately he only sold add-ons and ground units, no RV installs. Headed back into town and went to Discount Solar because the boys at the Hitchitch site had recommnded them this year rather than Solar Bill's. 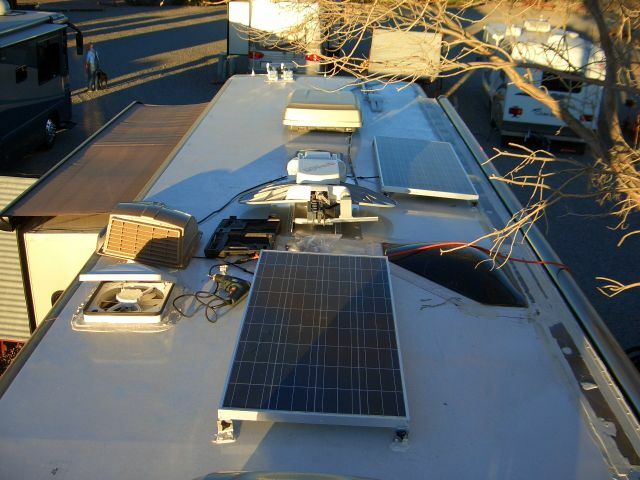 We were treated very well, their prices were very competitive to what we had researched on the net, so spent some real money and will have two 125 watt panels and a Solar Boost 2000E controller installed next Monday morning. 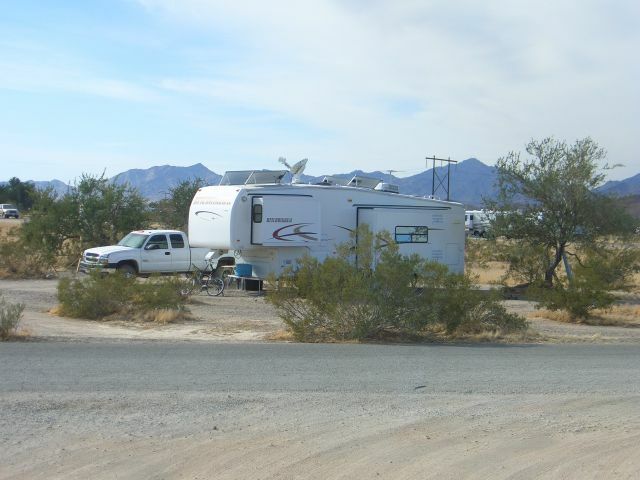 Returning to the RV, we walked back into town and bought some produce, plus Linda just had to get a Quartzsite charm for her Italian charm bracelet. Before dinner we dropped off the trash and walked over to where Ron and Terry of Hitchitch are parked to get a pix of the famous tomato plant, whose growth we have followed from infancy on their website. Ron was there and came out to talk and later Terry drove up so we were able to briefly visit with them. They are two of the nicest people you'd ever want to meet. It was one of those special moments when you get to actually meet and spend time with one of your life's heroes. It was their website that opened our eyes to the possibility of actually living the way we are. 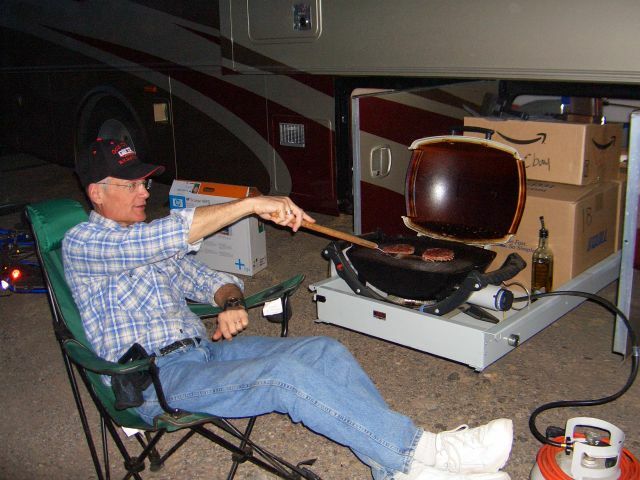 For dinner we grilled Quartzsite style sirlon burgers served with southwestern beans and salad. 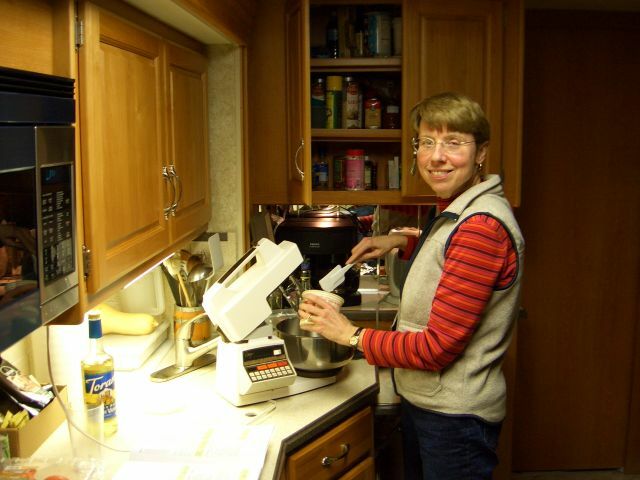 Later Linda made one of her "where'd you find that recipe" desserts. The answer is always the same, "just thought it up." As I always say - I married well. After enjoying the scrumptous chocolate dessert and toasting a major milestone of our retirement with a small glass of Vincent Arroyo Port - thanks Carl - we called it a very, very good day. 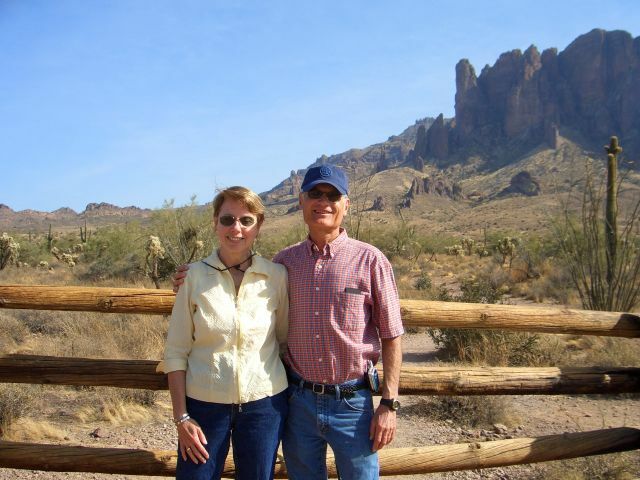 Jan 17 Can you believe it, we're in Quartzsite. 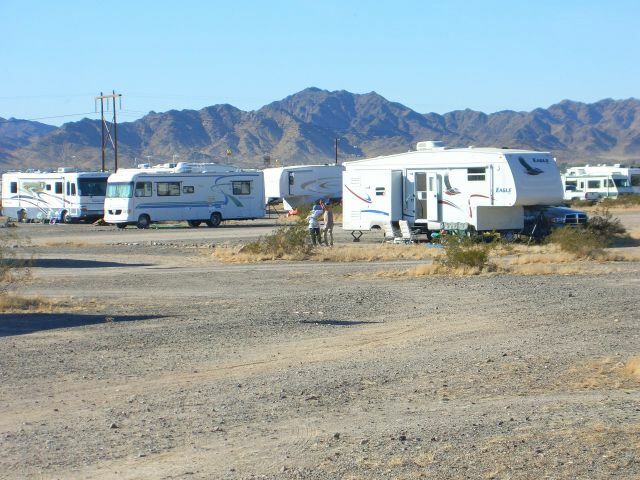 Took a walk this morning, the variety of RV's here is mind boggling, we even saw one fellow who had a airplane on a trailer. We posted some of the photo's here. 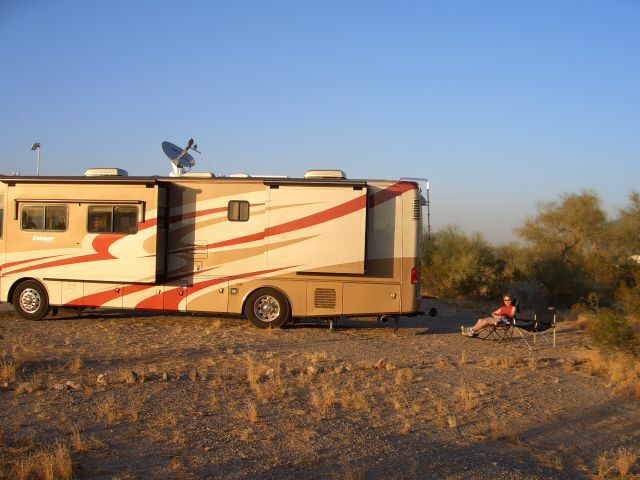 We noticed many people hooking up their rigs and pulling out making us think that there must be better places to stay (which wouldn't be much of a stretch of imagination). After a breakfast of oatmeal and mixed fruit topped with pecans and cinnamon, we drove towards town to look at some of the other parking areas. La Posa North, where Ron and Terry from Hitchitch fame are parked looked to be the best spot for us. It's about 1/2 mile south of where all the action will be taking place next week. 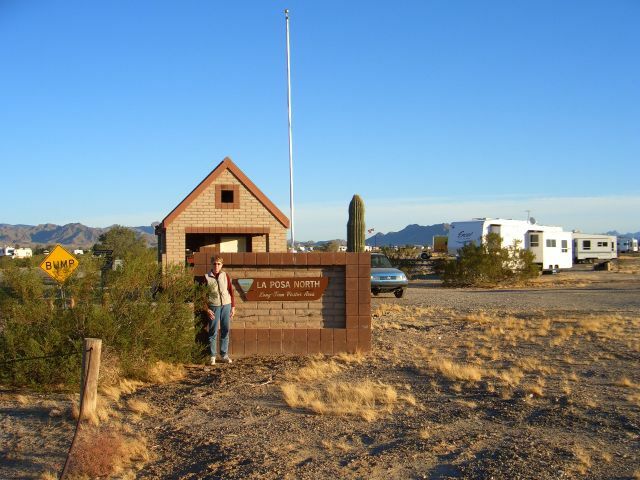 We drove back to Hi Jolly, hitched up the Explorer and returned to La Posa North, while Linda registered (they required exact change or check) Bob reconnoitered likely sites for the RV. Of course, we quickly found the very best spot in the entire 40 square mile area and proceeded to park there. How everyone managed to miss this spot we'll never know. After a lunch of, you guessed it, turkey wraps, we walked the 1/2 mile into town and spent the next 4 hours visiting vendor booths. 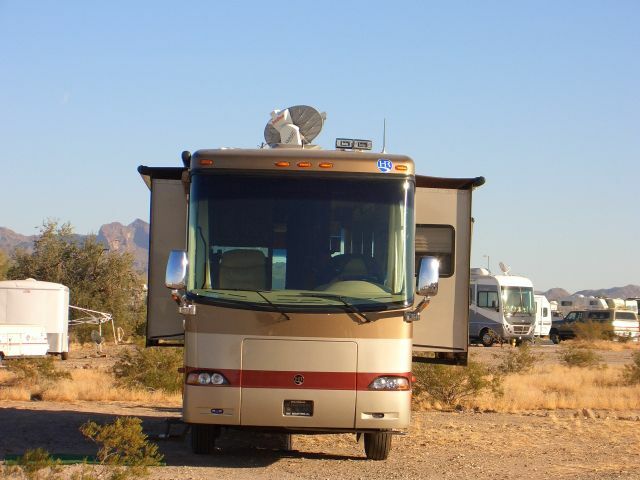 Somehow or other we managed to return to the RV with same amount of money we had when we left. However, many mental notes were made on items destined for future purchase. 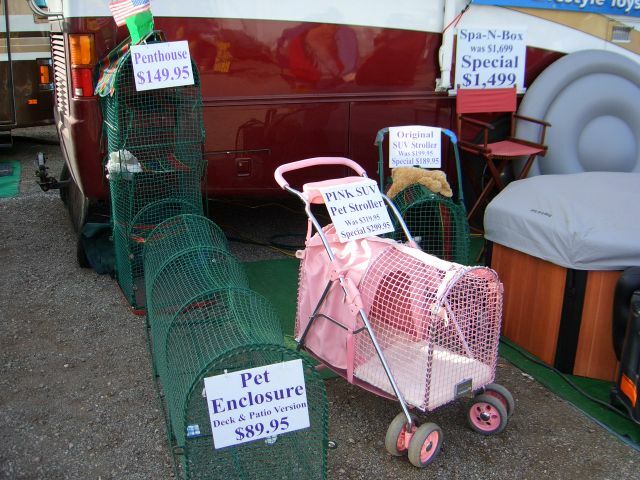 We also discovered the prices can vary significantly from booth to booth. 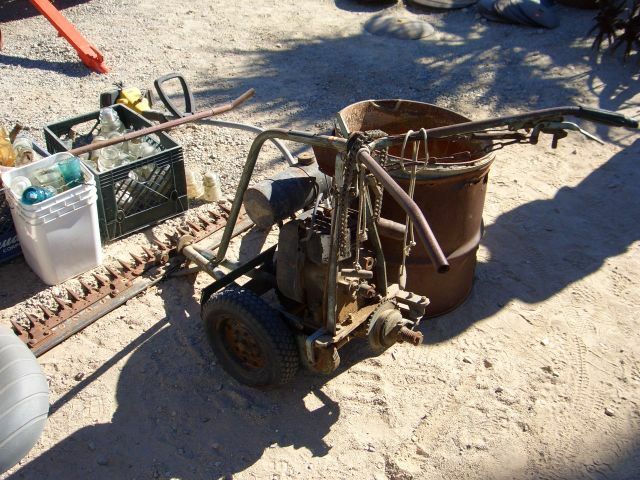 It really pays to comparison shop at Quartzsite. Returning to the RV we rested and recovered. The temperatures here are very intriguing, even though the outside temperature never got above 59 degrees we were quite comfortable in shirtsleeves and no jacket. The inside of the coach warmed up to 79 degrees and at 9:30 pm was still 65 degrees. Dinner was one of our favorites, cod and leeks with wild rice and salad. 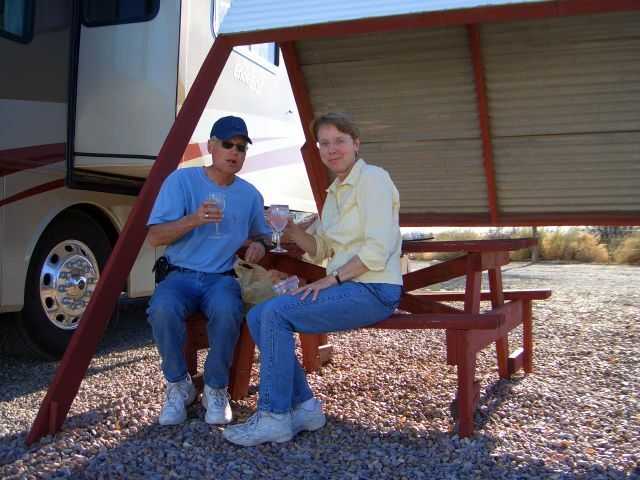 To celebrate the fact we were at Quartzsite, we broke out a bottle of Meridian Cabernet-Merlot wine, one of our favorites. Later we took a walk under the starry sky surrounded by the ever present hum of generators. We then worked on the web page before calling it quits for the day. Jan 16 Today is a travel day, but not just any travel day. 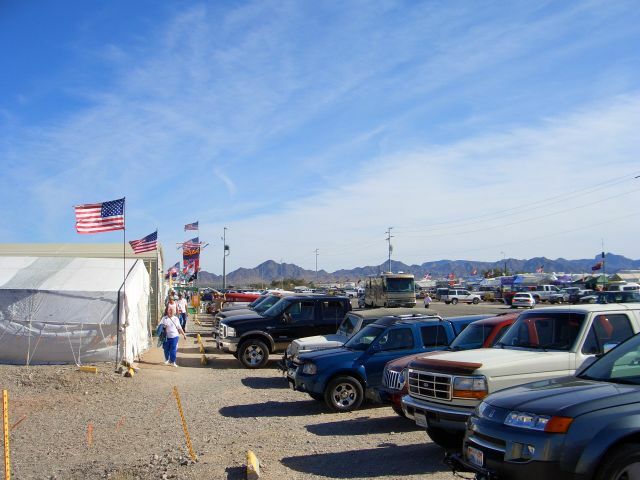 This is the day we are going to Quartzsite. We wanted to get an early start, but as the saying goes about the best laid plans ----. We pulled out of the Pair-a-Dice park just after 11AM. It wasn't because we didn't get up early, just too many things to do. After a delicious breakfast of sauteed onions, peppers and spinach, plus Bob's awesome scrambled eggs, we finished installing the shelf under the cook top. Next came putting all the pots and pans and 100's of other items of cooking apparatus that Linda brought along, into this area. After a few suggested pot placements by Bob it was agreed he would work on the web page and Linda would, with no sounds coming from Bob, arrange the dozen or so pots, pans and other items of cooking apparatus on the shelves. Next came putting all the tools in the tool boxes, sweeping the floor and rearranging some of the boxes in the under storage bay (the same ones we had just rearranged yesterday) so the tools would fit in the bay. Bob next tried to dump the waste tanks using the SaniCon pump, a job he managed to totally mess up (figuratively not literally, thank goodness) Once again, as has happened so many times in the past, Linda came to his rescue when she innocently asked where was the screw cap that prevents the waste from accidently spilling from the hose. Sigh, Bob had left it on the hose so of course nothing could come out the end of the hose. Double sigh, after it was removed the dumping process was completed in a few minutes. Another item for one of our ever burgeoning checklists. 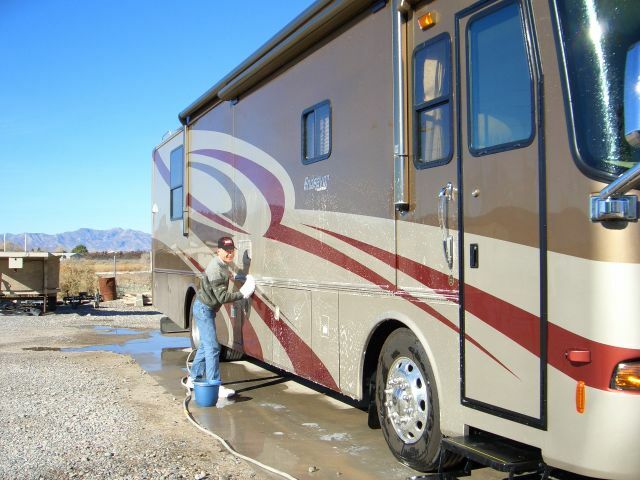 Since the coach and toad where both filthy from the trip up I-80, we decided to wash them so we would have nice shiny clean vehicles to drive around Quartzsite (note to self-Quartzsite's alternate definition is dust). 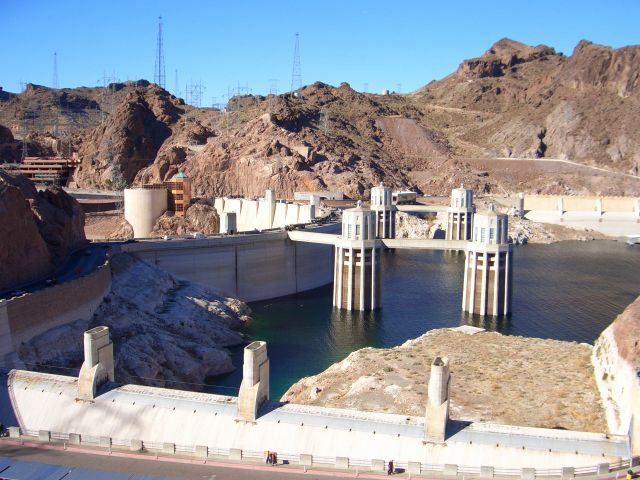 Our route took us across Hoover Dam, down to Kingman, Lake Havasu City, Parker and then straight south to Quartzsite. We arrived in Q just at dusk, barely leaving time to find a spot before darkness set in. 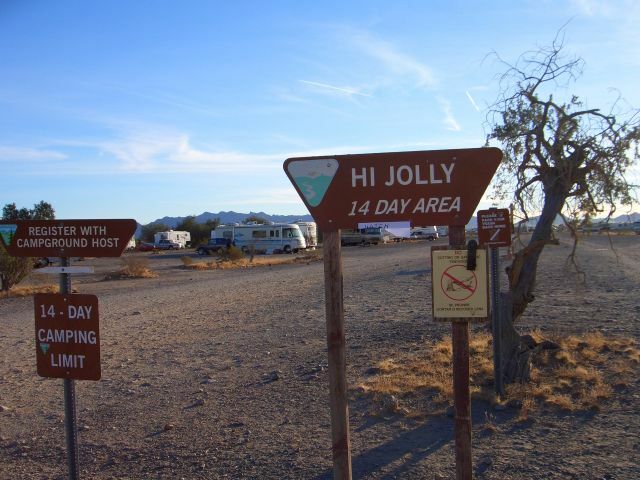 We passed the first RV boondocking area about 6 miles north of town, but did stop at the next one called "Hi Jolly" which is about 3 miles north of Q on Hwy 95. The actual entrance road was not too bad if we had been on it, the alternate entrance road we took with Bob blazing the trail had a few "big bumps" and then we heard some loud noises and crashes very similar to the sound of breaking glass as we bounced across some major ruts and not so small ditches. Heck, it was a good place for a road if they'd just of built one there. 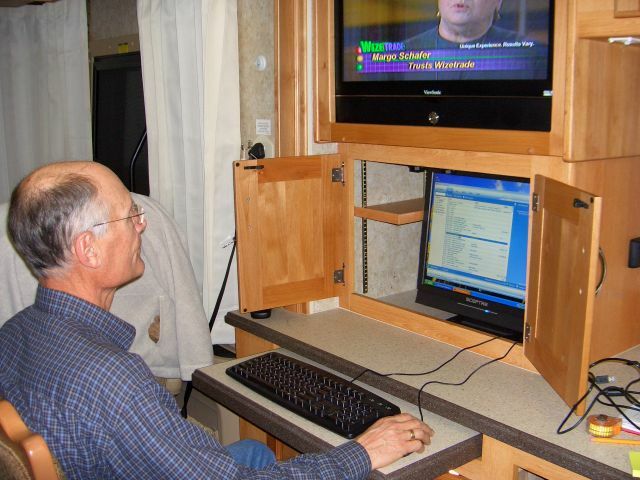 Bob envisioned all kinds of things breaking, including the monitor screen. Low and behold all that noise from one small, badly shattered tea pot. 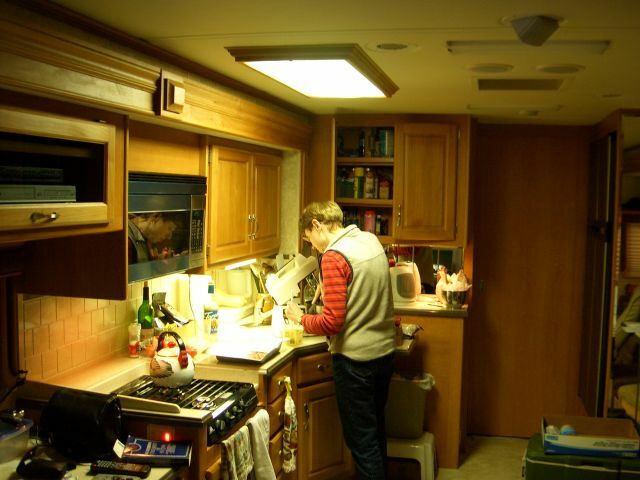 The cabinet above the sink had opened and had partially emptied with no other damage other than to Bob's pride. We then drove back a rocky road and parked among 100's of other rigs. 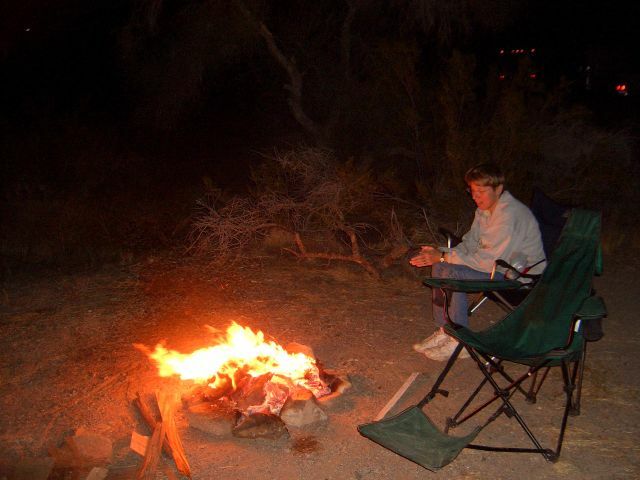 Later, after a supper of tuna melts and salad we went outside to listen to the sound of Quartzsite. The hum of hundreds of generators purring in the starry nite. Tired from the long drive, we turned in early. Think I'll end this days narrative early also, without relating our experience with our first attempt at getting diesel, followed by our first actual diesel fillup. Be assured it is something Linda and I will always remember. Jan 15 Sunday started out as a sunny warm day where we walked around the park in shirtsleeves and ended with cold 40+ mph wind rocking the RV. In between we accomplished a number of goals, got to talk to our daughter Jenny and saw some very brief snow flurries. Say what you want, but this retirement living sure isn't boring. 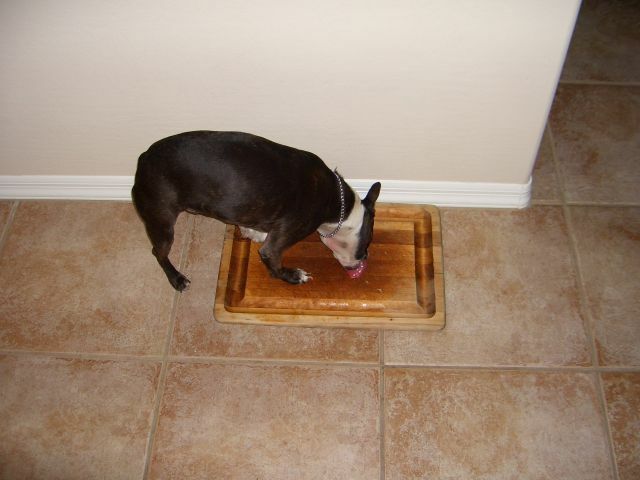 We had huckleberry pancakes for breakfast then worked on the shelf under the cooktop. While there are many things we really love about our new home, the utilization of cupboard space is not one of them. Thus we are adding a 2/3rd's deep shelf under the cooktop so we can more easily store our pots and pans. 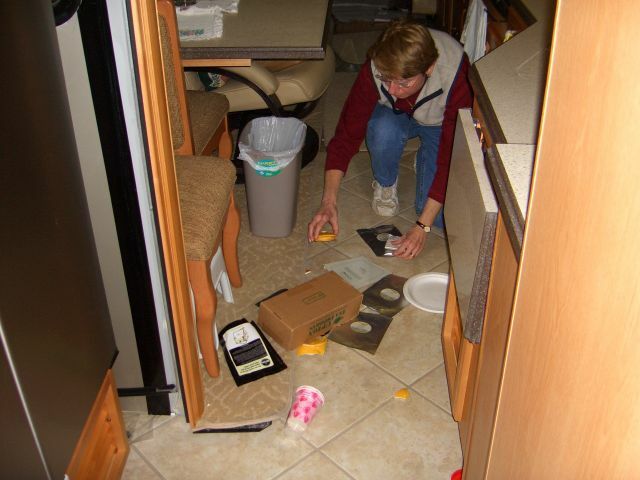 Next we tackled reorganizing the boxes in the bays under the coach. Neither one of us knew what was where so we did a complete inventory of what was down there. Of course this resulted in there being more piles of things we think we need in the coach which will probably end up being put someplace that neither of us will remember, sigh. Following a lunch of turkey wraps and with a very cold wind blowing, Bob tackled the problem of the non-pumping water pump. The coach manual has a troubleshooting guide, none of which, of course, solved the problem. 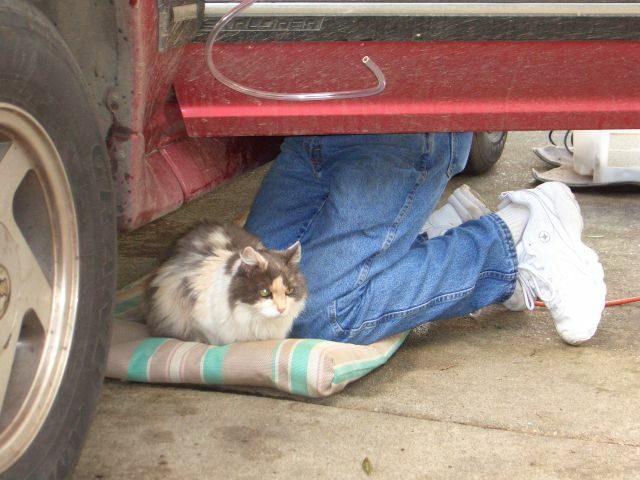 Bob finally figured out he could probably prime the pump by using the winterization port. It worked and the pump is now working normally. 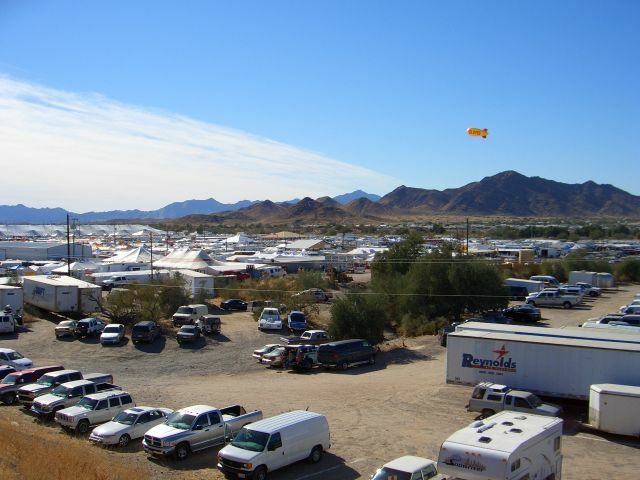 Tomorrow we can head off to Quartzsite if the winds die down. 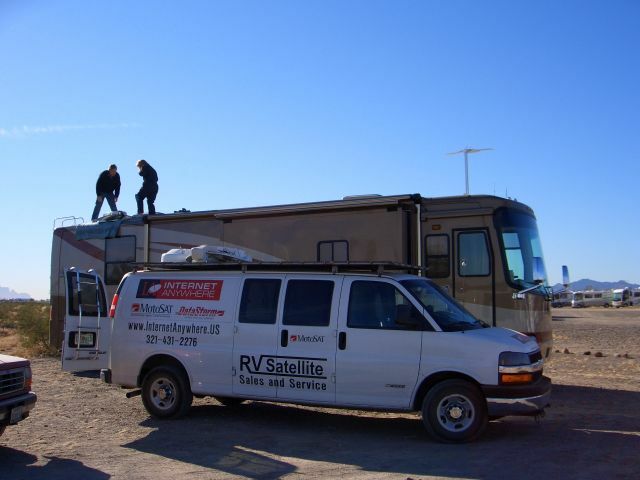 Later we contacted Bill Adams who will be installing our MotoSat DataStorm satellite internet/TV system and scheduled our installation for next Sunday, the 22nd in Quartzsite. Because Verizon reception was so poor at the park, we had to drive in town to the Walmart parking lot to make the call. What a coincidence, as we needed a few things from Walmart and that was also the first location where we got a 5 bar signal. Returning to the coach we had a supper of toasted pita chips and white bean chili. 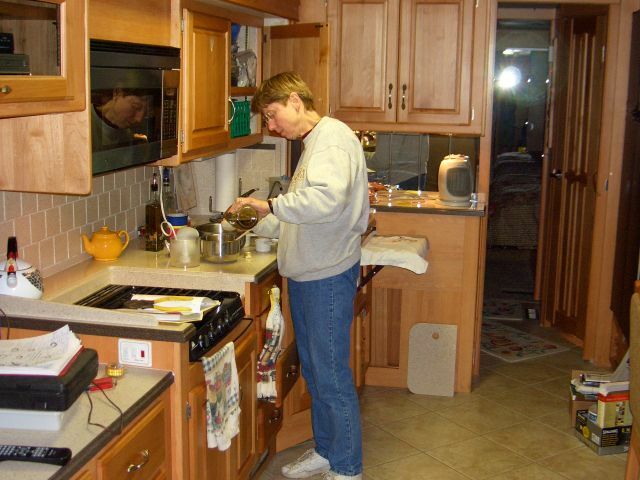 Later, as Bob worked on the website, Linda baked brownies and served them with warm Irish Cream flavored milk. Can that woman cook or what!!!! 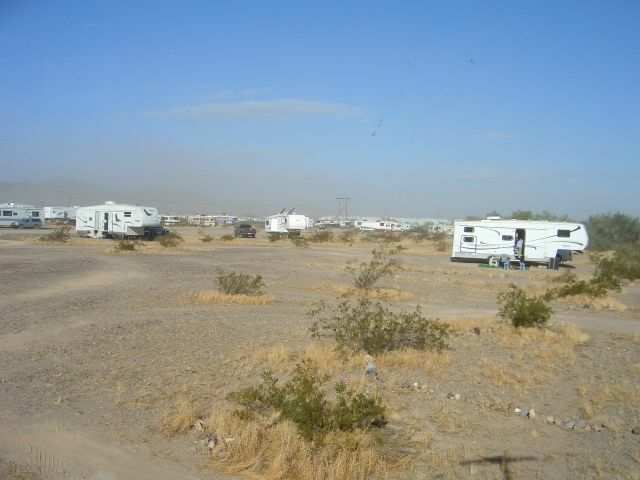 Jan 14 We decided to stay several additional days at the Pair-of-Dice RV Park to get more areas organized, besides this is almost par-a-dise. First off was the computer desk, With a few modifications to the shelves and one trip to the nearest Ace Hardware we now have our CPU, monitor, printer and scanner installed and it looks great plus it even works! Notice our on staff computer technician testing the setup in the photo below. Then Linda discovered when she went to the office to pay for two additional nights they have Wifi here and it is only $1.00 per day. So while we may not suffering from Internet overload, we have been able to mitigate our symptoms of internet withdrawal by surfing to our hearts content plus finally being able to send and receive email. 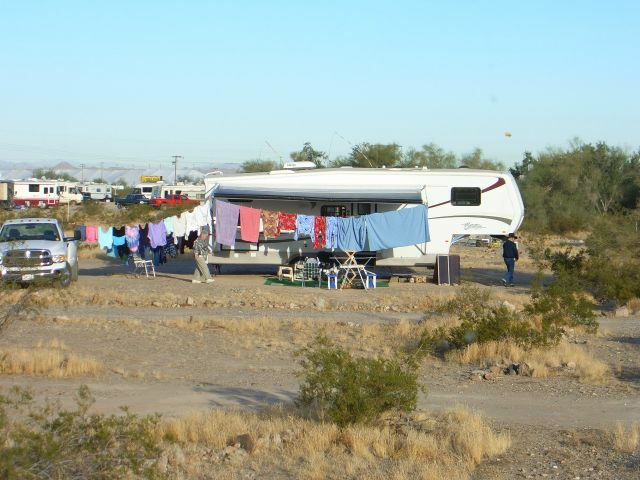 As Bob surfed, Linda did three loads of laundry and even hung out our sheets on the park's clothesline across from our site. Think we're settling into life on the road pretty well!! Lunch was different for a change, see we don't eat turkey wraps everyday, as Linda devised a great mini pizza from leftover sausage/spaghetti sauce, multi-grain bread and mozzarella cheese sticks. This was followed by a walk around the park to burn it all off. Later we had a fabulous dinner of salsa topped chicken (Bob's absolutely cooked to perfection super moist tender chicken) with butternut squash and salad. Continuing our eating binge, dessert was pistachio pudding and pecans - gotta eat a lot to keep our energy up since we are working so hard at this retirement thing!!! Jan 13 After a quick breakfast of cereal and milk we set out on our second day of travel. Stopped for lunch at a roadside rest area at the junction of 95 and 373, enjoyed our usual turkey wraps while we ate outside (62 degrees!, this heading south plan is working). 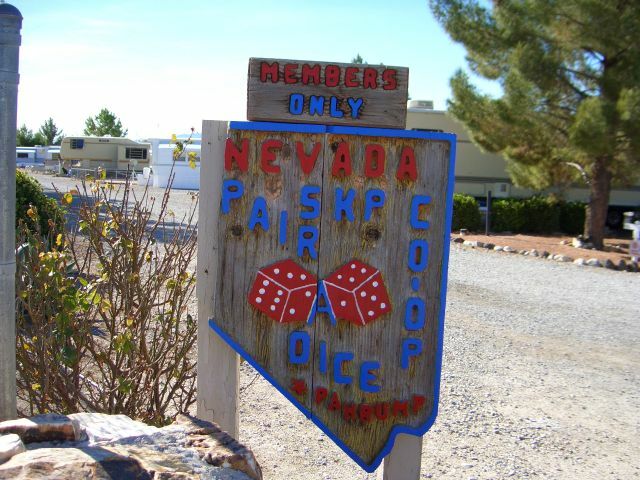 We then continued on to Pahrump, NV and stayed at an Escapees Park called Pair-of-Dice, this was our first experience at an Escapees Park, wow, did we feel welcomed, even got our first hug, then we were escorted and parked at the site, and introduced to our neighbors. Just to let you know that we are not perfect after two days of travel, we missed one of our turns and had to find a lot big enough to turn around in when we were trying to find the park. Be assured we did not miss the turn the second time. Later in the afternoon we drove the Explorer into town trying to connect to the Internet as we were having serious Internet withdrawal symptoms, but didn't have much luck until we drove by the library and saw they had Wifi. We went inside with the laptop and found they had tables set up for Internet connections and were soon online for the first time in 3 days. 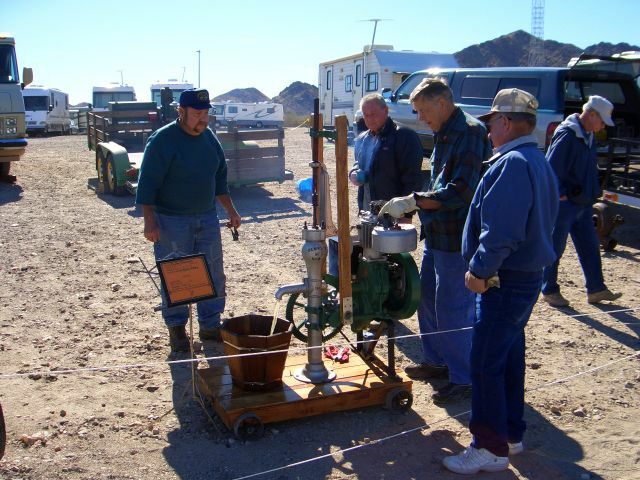 Back at camp we discovered our water pump was getting power and running, it just wasn't pumping any water. 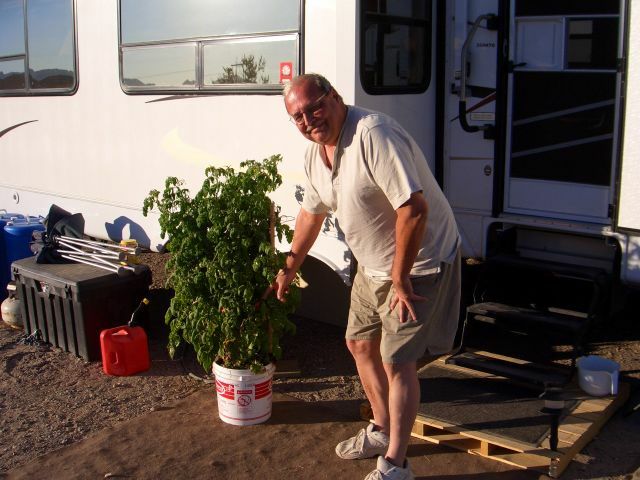 The quick solution was for Bob to hook up to city water and we will figure out the problem before we head off to Quartzsite, where it must be working or we are SOL. 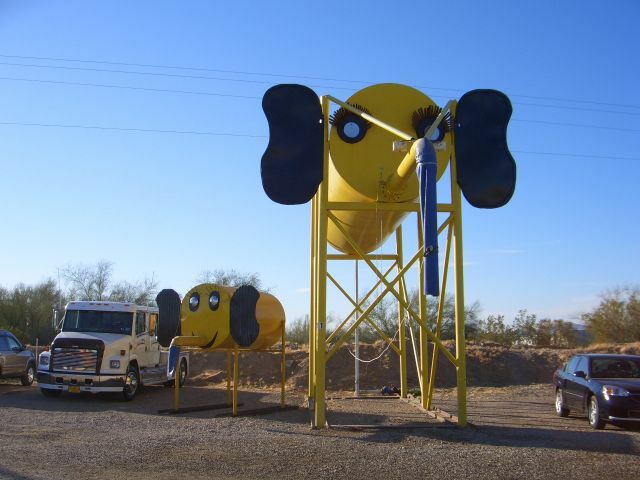 Here we even came up with a plan "C" in case we couldn't get it working, use the fresh water tank drain at Quartzsite to fill a bucket and get our water that way. Dinner was chicken burritos, refried beans and salad. After a relaxing evening of watching TV and a dessert of brownies we retired for the day. Jan 12 This is our "Dream Come True Day" because this is the daywe hit the road. After a breakfast of oatmeal and mixed berries, followed by some maintenance on the house batteries and washing the front windshield, we said goodbye to Comstock RV Park.We drove separately to the same parking lot where we had done the cone maneuvers as part of our driving lessons, only this time to hook up the Explorer, test the brake system we had installed yesterday and also to find out how well the Explorer towed. The Explorer may be 13 years old, but it towed like it had been doing this its entire life. Picture a 38 foot long, 8 1/2 foot wide, 12 1/2 foot high, 33,000 lb. 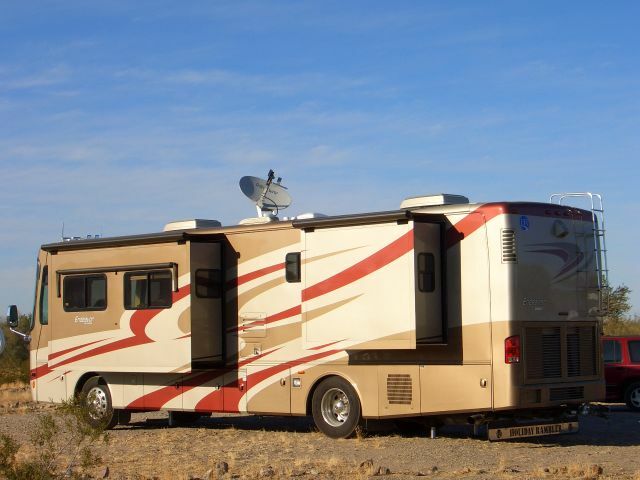 RV with a 4,500 lb. 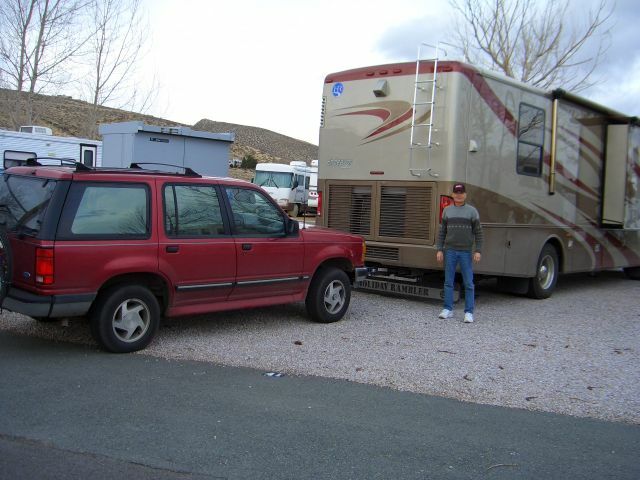 Explorer attached behind roaring across an abondonded Walmart parking lot (with Linda inside the Explorer watching to see if the brakes worked) and having the RV brakes slammed on to test the towing and braking system. Now picture the incredulous look on the fellow eating lunch in his pickup near where we were doing this and the high fiving and jubliation from us when it all worked exactly as it was suppose to!! Are we easily excited or what? 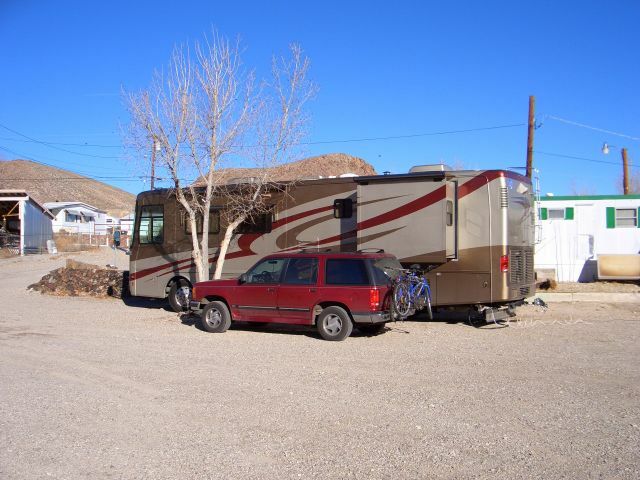 With everything working well, we were ready to travel to Tonopah NV just a little over 200 miles away. 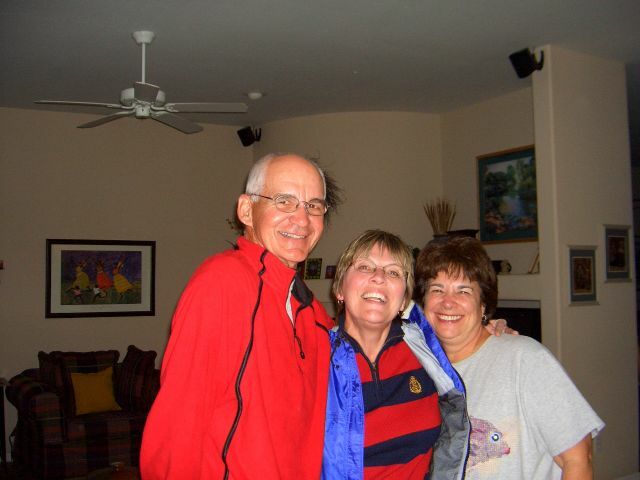 All day long Linda kept seeing reminders, like the coach's profile in the rear view mirror or its shadow on the road and realized again and again, what we were doing and where we were. 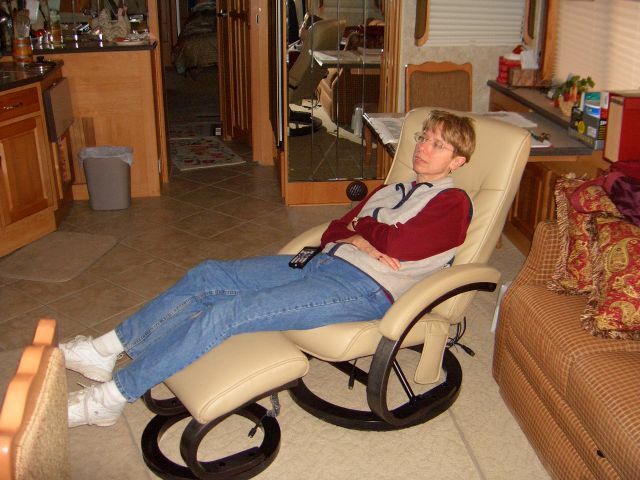 When Linda drove Bob relaxed in the passenger seat with the foot rest up and just kept saying "We're actually doing it, I can't believe it, Now I know why all the people on the internet keep saying if you're thinking about it, do it, find a way." Wow!! It is real! We had a mostly unventful drive, only had sweaty palms once when we were overtaken and passed on a narrow stretch of road by a semi. Lunch was turkey wraps eaten while parked on a vacant dirt lot in Hawthorne. 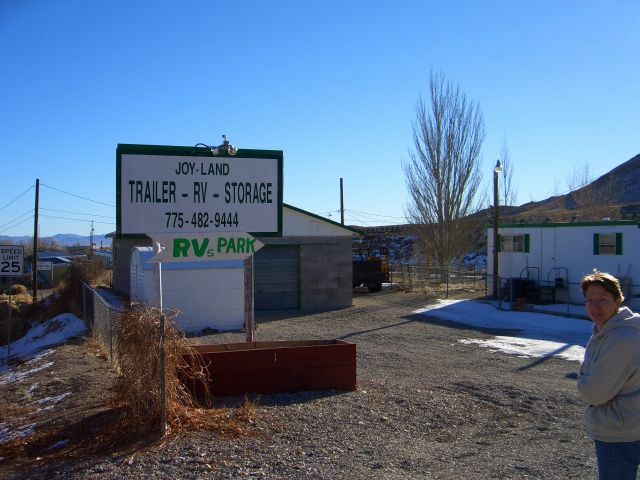 Tonight we stayed at Joyland RV Park in Tonopah's only pull through site! We have a FHU site with cable, all for $14.00. Jan 11 Today started off with storm clouds on the horizon, but turned into a nice day. 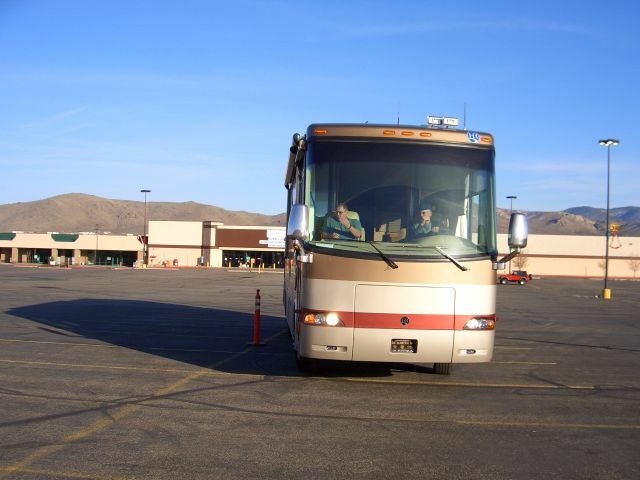 After a breakfast of english muffins, canadian bacon and scrambled eggs topped with parmesan cheese we walked up to the Costco, which is next to the RV Park and proceeded to get our morning exercise by circumnavigating the parking lot several times. Most of the remainder of the day was spent installing and testing the SMI brake system in the coach. 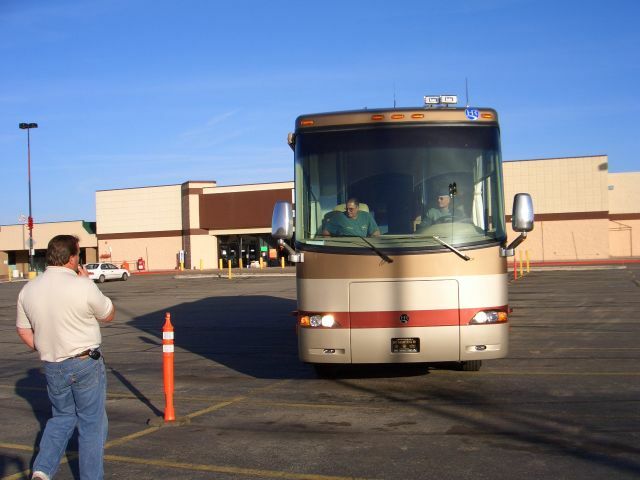 This included at least 50 trips from inside the coach to the outside, a trip to Kragen Auto Parts for some connectors and a stop for a lunch of turkey wraps. Each test during the installation worked just as it should, meaning we should be good to hit the road tomorrow and head towards warmer weather . After a dinner of Bob Evans sausage patties on a toasted english muffin, accompanied by southwestern black beans and a tossed salad, we went shopping. We stopped at Lowe's for a shelf board to go under the stovetop, then at a Keva Juice store (parking lot) to send and receive email and upload the website. Unfortunately for those expecting an email from us, we were unable to send, only receive emails. While we were doing this, back at the coach, our washer/dryer was doing another load of clothes, however, tonight we included a pair of bluejeans in with the other clothes. When we got back from the shopping trip the load was washed and dried, so much for those who post on the internet that you can't do this. 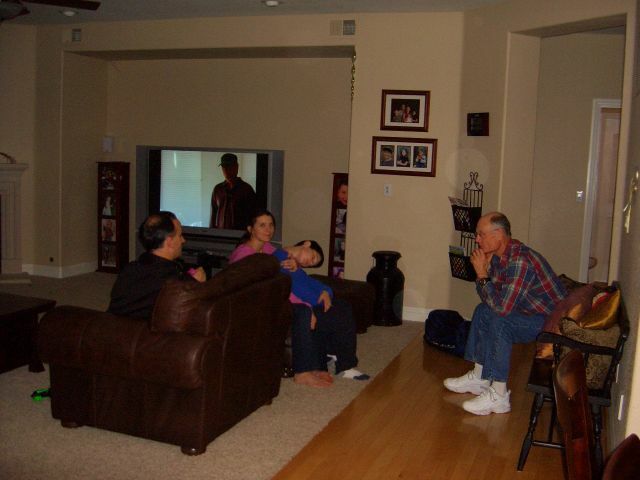 Later we baked a new recipe of brownies and watched "Lost", all the while eagerly anticipating the morning. Jan 10 Day 2 of Driving School is on tap for today. Ron and Vince arrived at 8:30, we were all ready to roll. We began by driving (Bob) through Carson City, and then we tried to go up the back way to Virginia City, but the road weight limit restricted us so with Linda driving we turned around on the narrow road and went another way, taking the truck route up with Linda droving up the 7 miles of curvy road to Virginia City. She did great, then Bob drove down gaining experience on the Exhaust Brake, another great job!! Are we both great or what!!!! Linda then drove through a Hotel parking lot making very tight turns and we were just amazed as to how you can manuver this 38' coach. Next we drove to a gas station so we could add that experience to our driving achievements. All in all this driving school has proven invaluable to both of us. 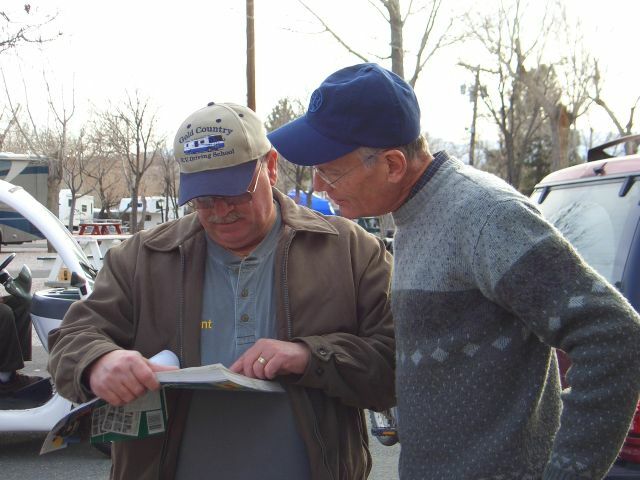 Thanks Ron and Vince of Gold Country RV Driving School. If you're thinking of taking lessons you can't go wrong with them. This evening we tried something new. We washed a small load of clothes to see how the washer/dryer performed. Are we ever glad we got it!!! It was so easy and will make our life on the road easier. 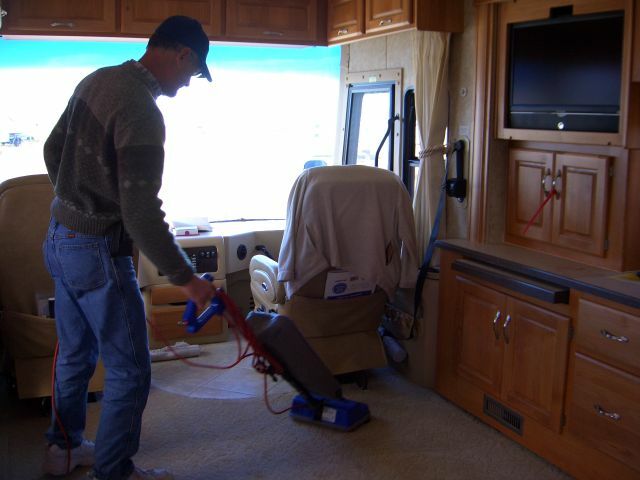 I had read many posts on the net both pro and con about RV washer/dryers. After only using it one time I will comment that I couldn't imagine being without and think the people who knock them probably see only the bad in most things in life. Jan 9 Big day again today. Driving School Time!!! 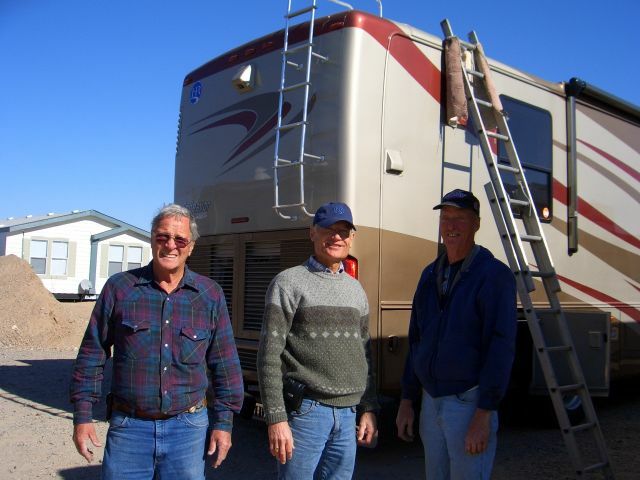 Just as promised, at 9AM Ron and Vince from Gold Country RV Driving School walked up to the RV. The day began with a very thorough walk through of the inside of the RV, followed by a just as thorough walk around the outside. This was great as it served to reinforce the things we knew, refreshed our memory about the many things we had forgotten from the dealer's walk through and taught us even more things we had no idea about. As we realized afterward, besides providing much need knowledge it also served to calm us down and make us more relaxed for the driving portion of our lessons. These guys know what they are doing! Next Ron explained what the driving portion would entail, which suddenly brought us face to face with the enormity of what we are undertaking. 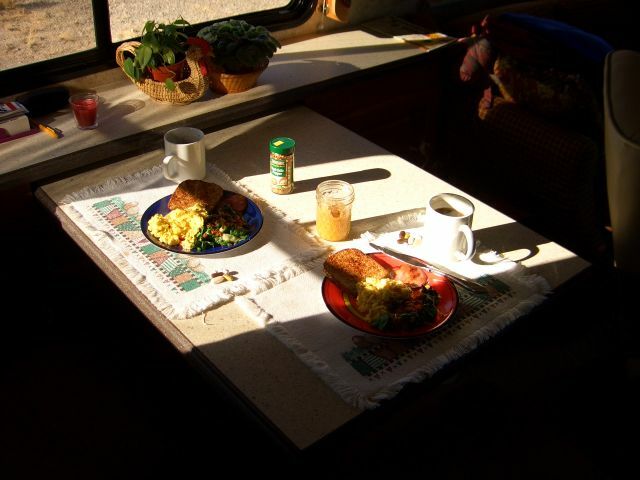 Lunch would be the first order of business and wefound out we would be going in the RV to the restaurant. 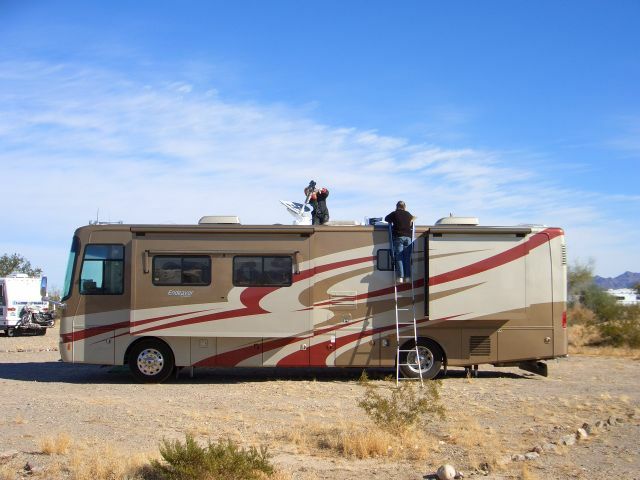 After having done it, I must say you can take one of these RV's just about anywhere! After lunch we went to large unused parking lot and took turns doing turns. Then the cones came out. Spaced 48' apart, we snaked around them by going in both forward and in reverse. This really burns your pivot points into your brain and if you can believe, we did all this without either one of us ever hitting a cone, awesome!! 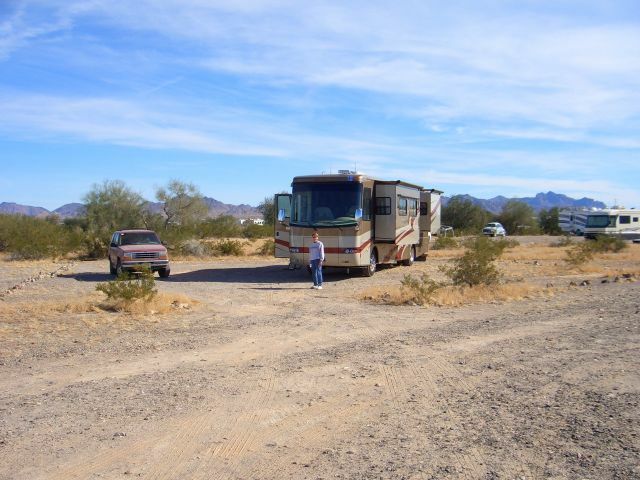 Finished by driving back to the RV park and backing the coach into our site. As would be expected, Bob was much more confident with driving, but Linda knows she can also do it if necessary. Finished up the evening by driving up the road, in the Explorer, to Walmart and getting a few odds and ends. 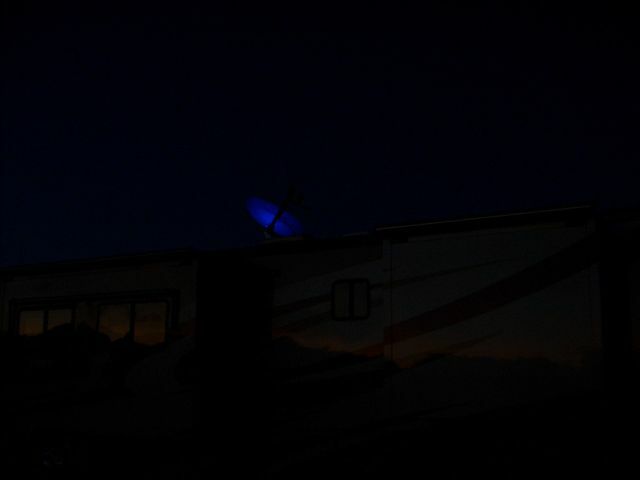 Thus ended our first full day of RV living. Jan 8 Our daughter and grandson came over this morning to go over the jobs they will be doing around the house as we travel around the country. 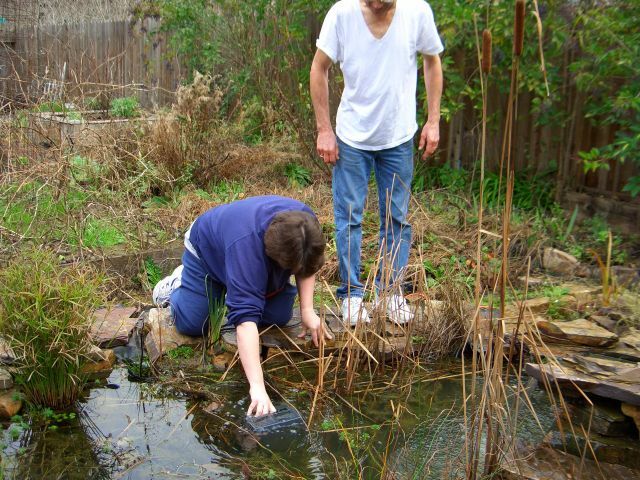 Things like the lawn mower (it has electric start, but of course the battery was dead today) and cleaning the fish pond filter. Sounds like it is definitely time to leave home and take a long trip. Packed up the Explorer for the final time, did a last walk around to see if we had forgotten anything and pulled out to head back to Comstock Country RV Park. 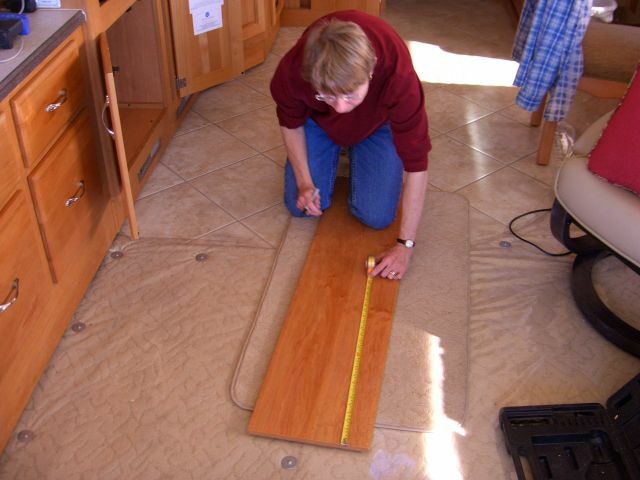 Didn't get to far before Linda checked her list and found out we had not packed our measuring spoon set, nor had we turned down the water heater. 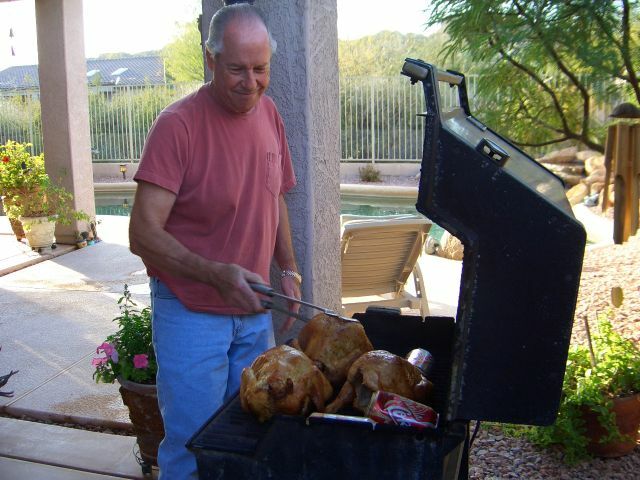 It was mid afternoon when we got back to Carson City for more unpacking and a supper of turkey burgers and salad. Rearranged some things in the kitchen, baked some awesome brownies in the oven, watched Desperate Housewives and called it a day. Jan 7 A busy day doing all the final things at home. 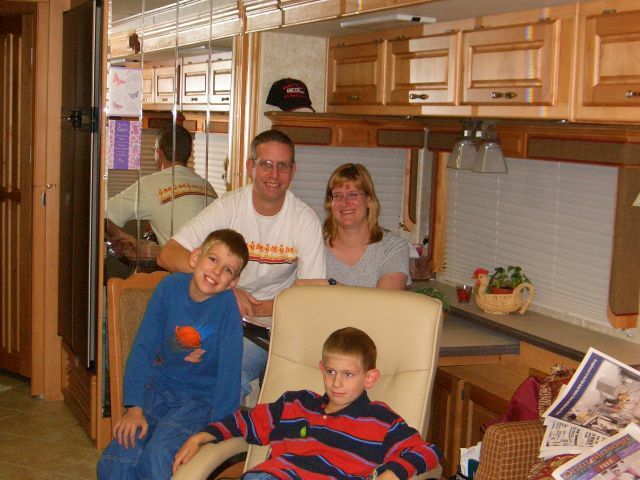 Installed the SMI Silent Partner Stay-in-Play braking system in the Explorer, then later got together with all the kids to celebrate both Linda and Justin's birthdays plus our retirement and new lifestyle. 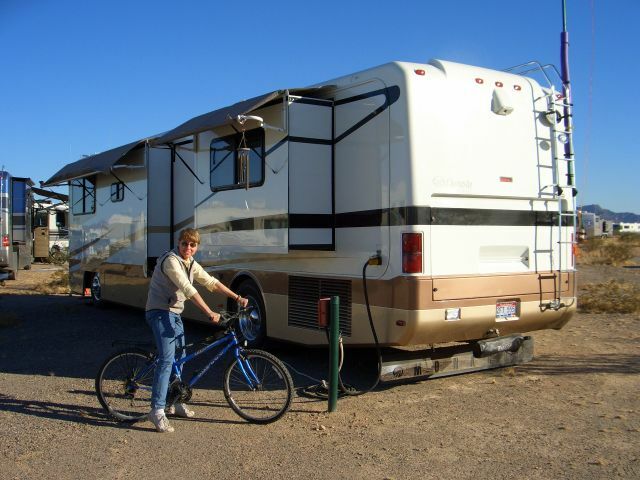 Jan 6 Today is the day we (actually it's going to be me, but Linda will be there in spirit) need to drive down to Comstock Country RV Park in Carson City. 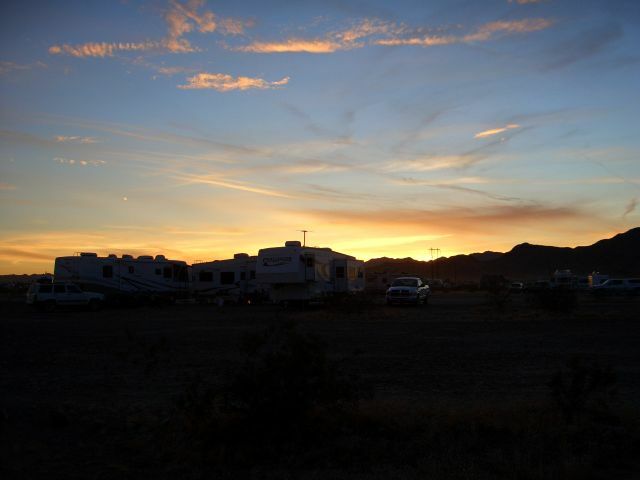 Up early, transfer boxes to the RV, put some things away, took a walk around the RV park, mostly to calm frayed nerves, then drove up to the nearby Casino RV lot to practice backing. Discover it is different from the Jamboree, think Bob has a little more confidence in his driving ability, but Linda sure isn't very confident in her directing abilities. By now it is after 10:30 and we need to get on the road to Carson City. Off we go with Bob driving the coach and Linda following in the Explorer while using the walkie talkies to communicate. Right off the bat it ain't easy. The eastbound I-80 on ramp at Boomtown is a very short ramp. 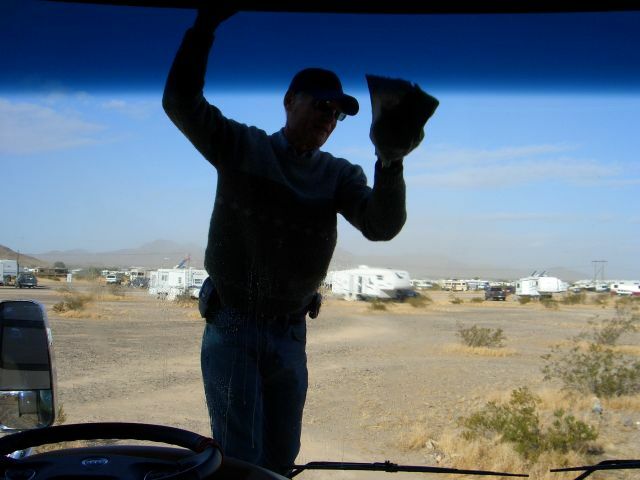 Of course Bob is more concerned about keeping the RV in the center of the road than looking ahead to see how long the ramp is. Fortunately there was no traffic approaching on 80 so it was an easy merge, but still a lesson learned. 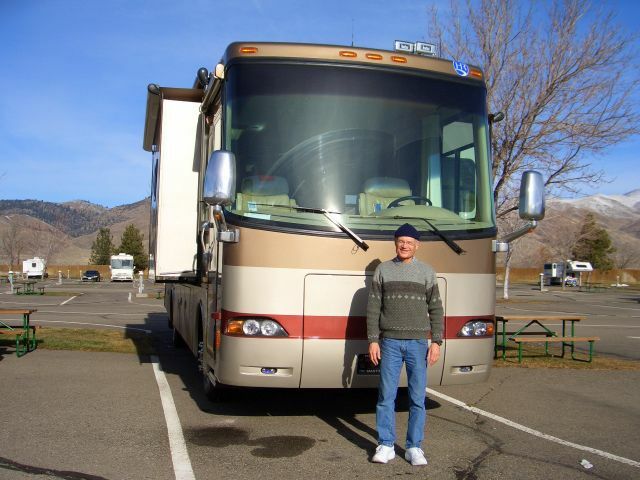 As miles rolled by Bob became more and more confident with operating the RV. The drive through Carson City, with the narrow lanes was easily handled, the sign said trucks use the left lane so that's where we drove. 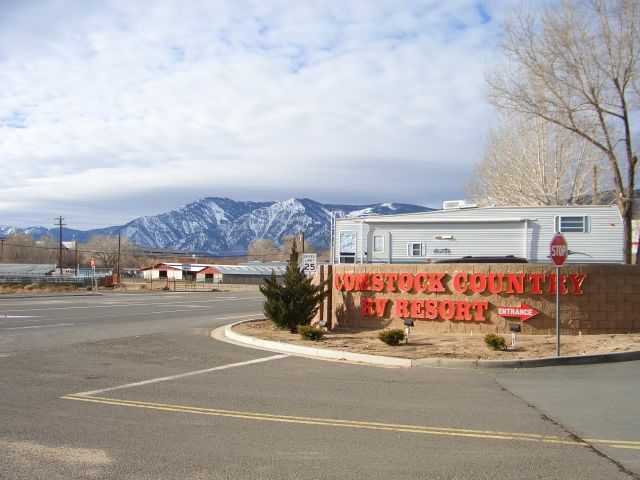 We registered at Comstock Country RV park and joked with the people in the office over our status as newbies at this. We unpacked some more boxes, realizing we had things we would not need. After supper, put the things we weren't going to need into the Explorer and drove back home. Jan 5 Today we get our coach!!!!! Up early, like 4:40 AM, nervous energy burning overtime, we're supposed to leave for Boomtown between 9 and 10. The driver had a late delivery yesterday, so they are to call when he gets to the lot. We have to turn in the cable box and modem, so took them to the nearest agent. No call from the dealer, so called them. Everything should be good to go about noon. Head on down to the dealer and when we arrive the driver is there. When he starts up the coach, he discovers the temperature gauge is pegged on high. The Aladdin Jr monitor system is working, so we know the engine is functioning normally. Found out they had pulled the dash when trying to find the brake hookup connector per our request. Apparently this caused the problem. At first they thought it was a short, finally decided it was a malfunctioning gauge. It will have to be replaced somewhere in our travels. Finally at 1:30 we were on our way, I rode in the passenger seat while Linda drove the Explorer closely following the coach. By the time we got to Boomtown it was 3:40. Got all the paperwork signed and the coach was finally ours!!!! The driver left and it was show time. Because it was so late we decided to stay at the campground in Boomtown, rather than to drive down to Carson City in rush hour traffic while darkness descended. Which with some hindsight turned out to be a very good decision. Slowly drove down to the campground, making the first turns. Not bad, but room for improvement. Got checked in and with Linda leading, drove to the site. However my guide didn't do so good as she went down the wrong aisle with me dutifully following. (Probably the first of many times). Finally got to the right site, it was a pull-in and after only 3 attempts got the coach parked. (These things sure don't turn like a normal vehicle) Turned out the fellow in the site next to us used to deliver RV's and he got a good chuckle over our parking antics. Jan 4 Final packing and running around trying to tie up all the loose ends in our current life. An impossible, yet necessary task. Jan 3 Today retirement becomes reality. After all these years we no longer have to get up at 5AM and go to work. Oh Happy Day!!! More packing again today. Setup and installed a computer for one of our daughters so she will be able to send and receive email and more easily follow our travels on this website. Jan 2 A day spent wondering what things we will take that we don't need. A day spent wondering what things we won't take that we will need. A day spent running around on last minute errands. A day when we began to realize the enormity of what we we are undertaking. Jan 1 Starting out the New Year means starting out on our adventure. Thought we'd try something new right off the bat, so went to a different church this morning. Having been fortunate enough to be born early enough to have listened to the birth and early years of rock and roll, we have come to really appreciate contemporary services with the electric guitars, throbbing base, drums, keyboards and very talented vocalists. As we travel about the country we hope to be able to sample the full range of contemporary services, but I have to admit to being most partial to the "hard rock" type of service. As for sermons, I prefer a message from a speaker in blue jeans who helps me live my life; to a dry, suit clad pontificator who talks over my head any day.